Circumnavigator Blog, www.circumnavigatorblog.com, has moved to a wordpress.org site, or actually it is .dk for choosing Denmark as the host country for my travel society. The new address is www.CIRCUMNAVIGATOR.dk. But that doesn’t mean that I don’t want visitors and followers from other countries than Denmark. 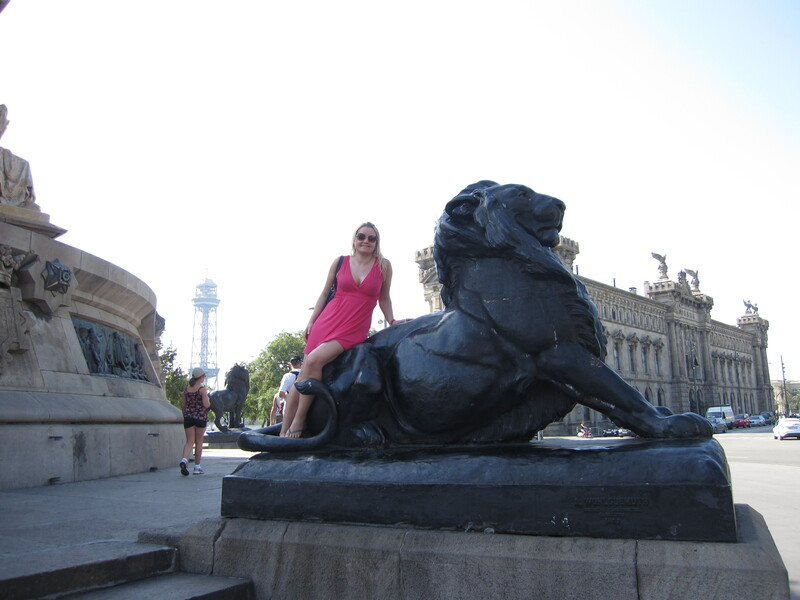 All my blog posts will still be in the best English I can do and after all travelling is a global interest – isn’t it? But as a told my teacher during the education, there are also some trade offs with choosing wordpress.org instead of wordpress.com. The wordpress.com is more like a social network and global community with the integrated Follow, Like and Reblog buttons, whereas in wordpress.org you are a land of your own and have to work harder to bring your community to life. Of course I hope that my already followers and likers from wordpress.com will continue following and put the new URL http://www.CIRCUMNAVIGATOR.dk in their reading list. Please see photo below on how to do this. Or you can also just press the RSS follow button in the top right hand corner and sign up for receiving news in your mail box. 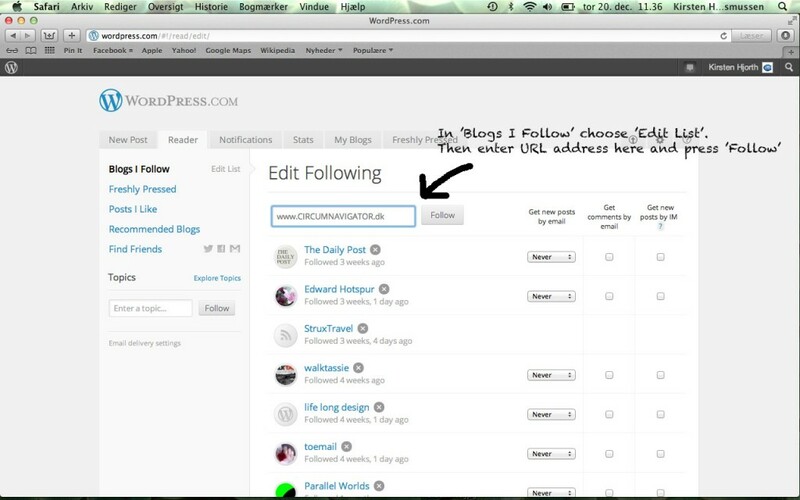 If any of you readers have other ideas how to follow a blog or like a post on wordpress.org, then please let me know. Remember, I am still fairly new in this game. I promise, I am still following all you guys – the writers and photographers, the food, culture and nature lovers and especially you fellow travellers. You all give me so much inspiration. 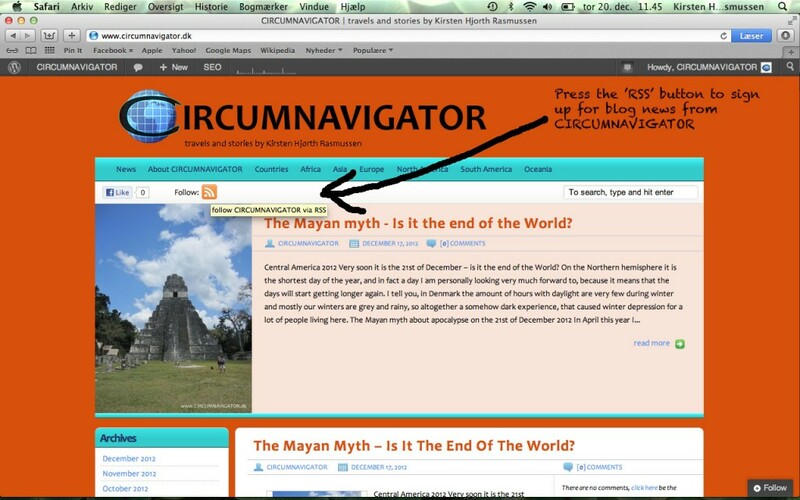 To read something more exciting travel news, then go to: http://www.circumnavigator.dk/2012/12/17/mayan-myth-is-it-the-end-of-the-world/ to read all about my visit to the Mayan ruins in Central America, and there is also an answer to the questions: Will the World end tomorrow? These days I’m not walking a lot – not that I don’t want to, but unfortunately I can’t. Last weekend I sprained my ankle because I fell from high heels and it is still very blue, swollen and hurts like h***!!! And me who loves walking, running and moving around seeing and experiencing things around me – now I have to stay inside with my foot up as much possible. Sorry for being a bit negative, but not at all amused with this situation!!! So the past week apart from following an online course in Photoshop – I’m looking forward to present some of my material here on Circumnavigator Blog very soon, I have watched television and read news on the internet. The other day I found out that the movie premiere of “The Hobbit – an unexpected journey” is coming up very soon – actually here in Denmark a couple of days earlier than in UK or the USA. All this got me to think about one of the most rememberable walks I ever did. 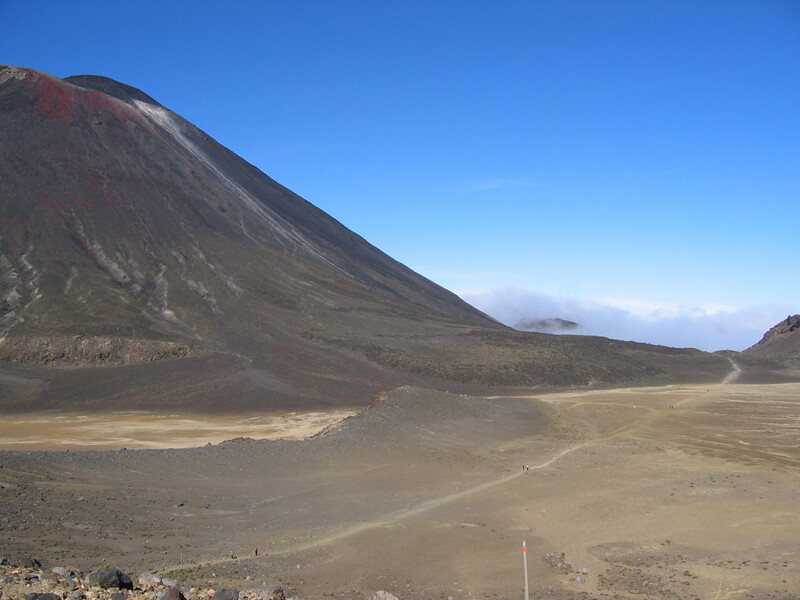 It was in New Zealand back in 2007 that I did the one day trek Tongariro Crossing. The trek is total 19,4 km and is set to take 7-9 hours. 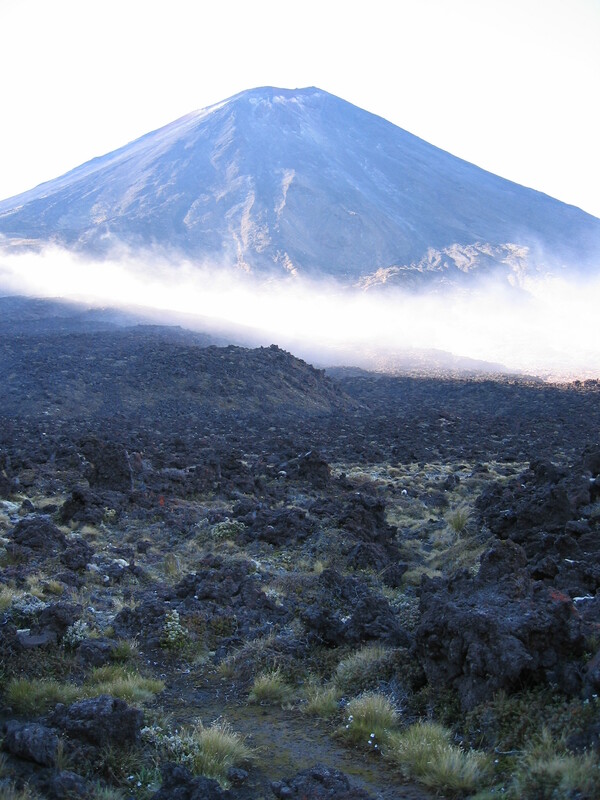 The distance itself is not extreme for a one day walk, but this trek is situated in a volcanic national park with mountains, rocks, lava and steep up and down climbing. Some parts of the trek are with paths to follow, but most of the tracks are set in rugged nature, so along many parts of it, it is adviseable to find the inner climber in you. 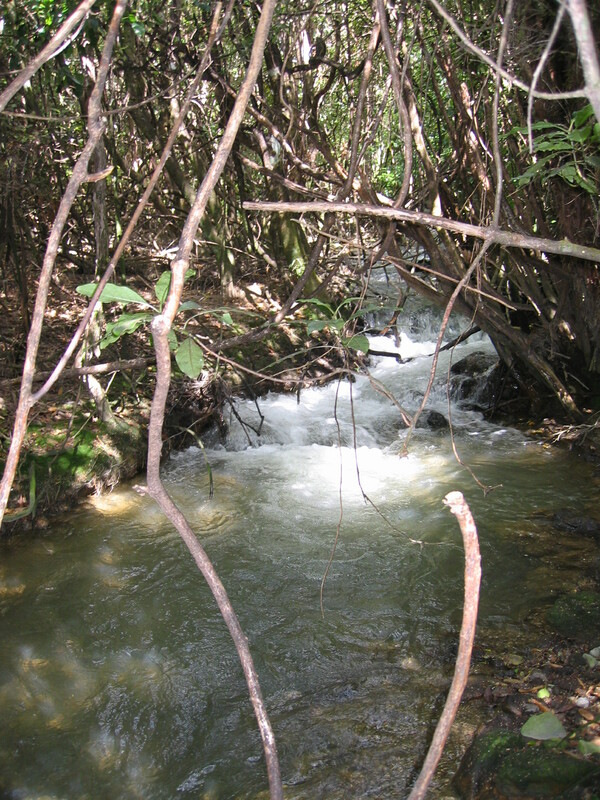 I did the trek together with my ex-boyfriend and it was good to have somebody to walk with to give a helping hand at the very steep parts or boost the moral when it got low at the end where it seems there is no end to the path that swirls though a dense forrest. 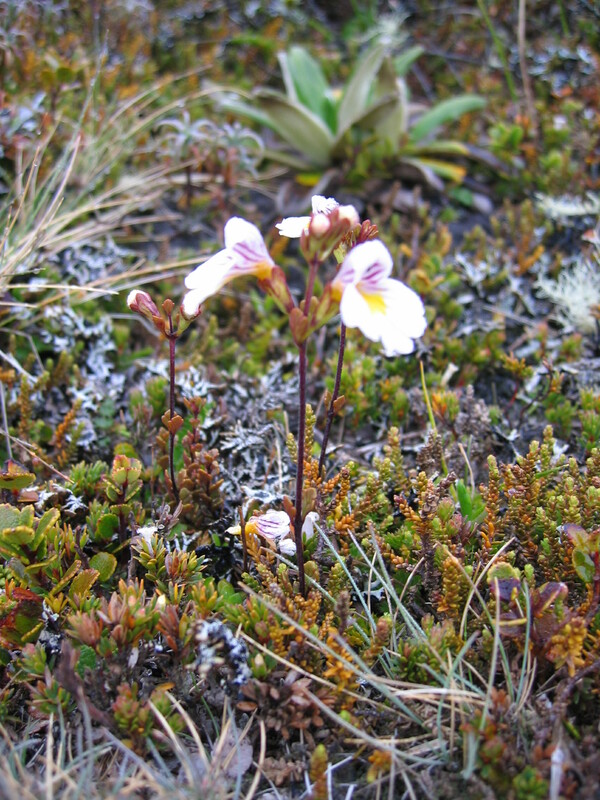 Because of the many difficult parts of the trek, I recommend to wear good sturdy hiking boots. It is also very advisable no matter which season you are doing the walk to wear multilayer clothes. Even in the summer it can be very cold and misty or rainy in the morning and later when the sun burns through the clouds it also gets fairly warm on the top of the mountains. You do start early in the morning in order to be at the end before the dark sets in. A bus picked us up at 5:30 o’clock from our hostel in Taupo and at 7:15 we commenced the walk from Mangatepopo Car Park. 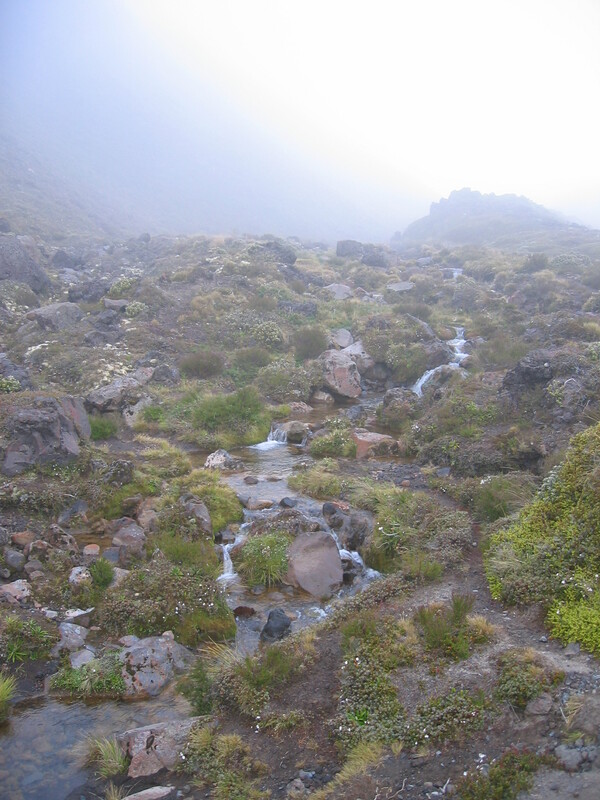 The first part of the trek through an alpine landscape at 1150 m. above sea level is fairly flat and easy but this morning was misty and a bit cold so it took a little while before the legs were warm and the walking pace up. But what a beautiful magical mood the mist brought to the scenery. Instead of nominated 1 hour we used 1 1/2 hour before we stood at Soda Springs below The Devils Staircase – a steep climb up 400 meters. Full concentration was needed but though it was hard, we made it in the nominated 45 minutes. 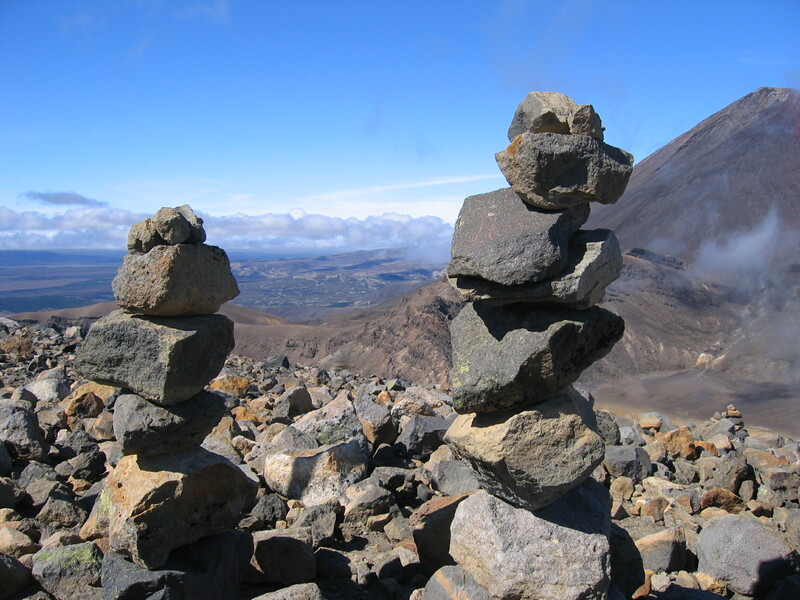 We climbed from grey mist into clear sunshine and the perfect cone-shaped volcano Mount Ngauruhoe stood above us in sharp contrast to the blue sunlit sky. 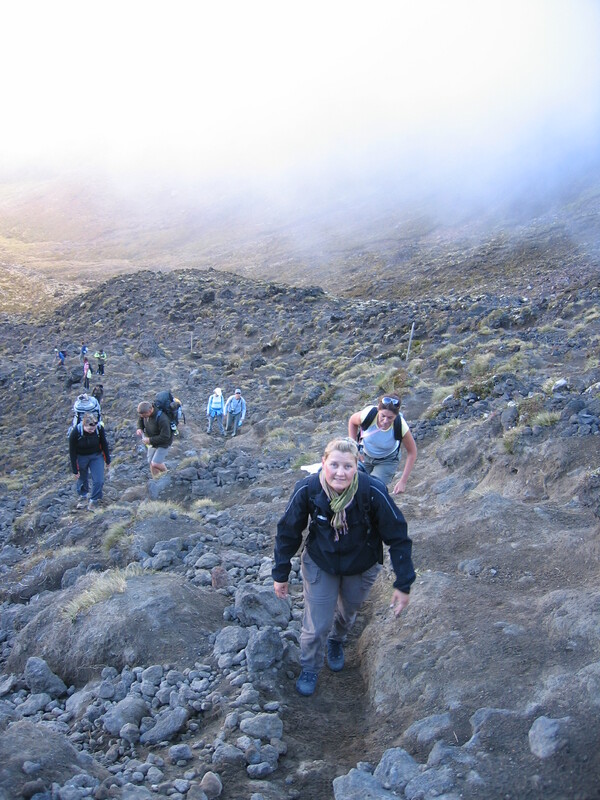 After a flat hike through South Crater another climb was ahead of us – not as long and steep as the previous but still full concentration was needed, since this was full of loose stones with the risk of rolling backwards and possibly injure yourself every time you took one step up. 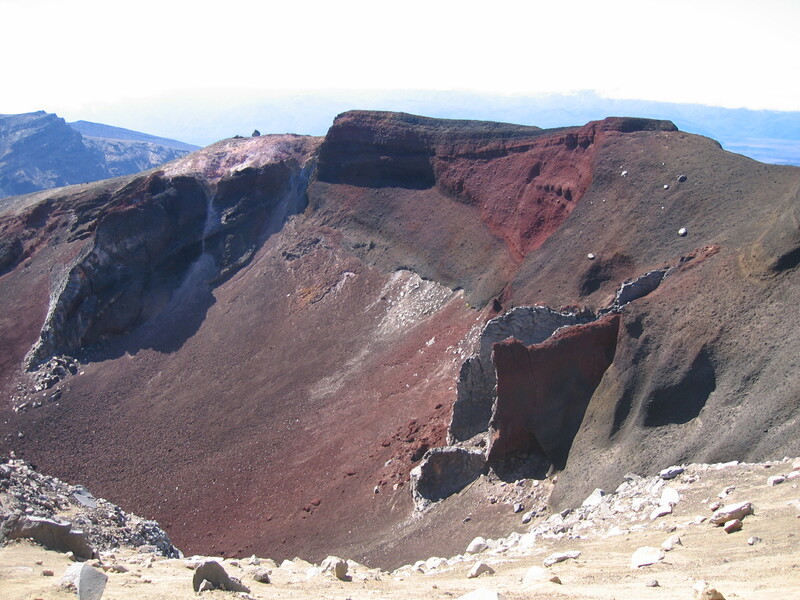 At 11 o’clock we reached the summit of Red Crater – altitude 1886 meters. 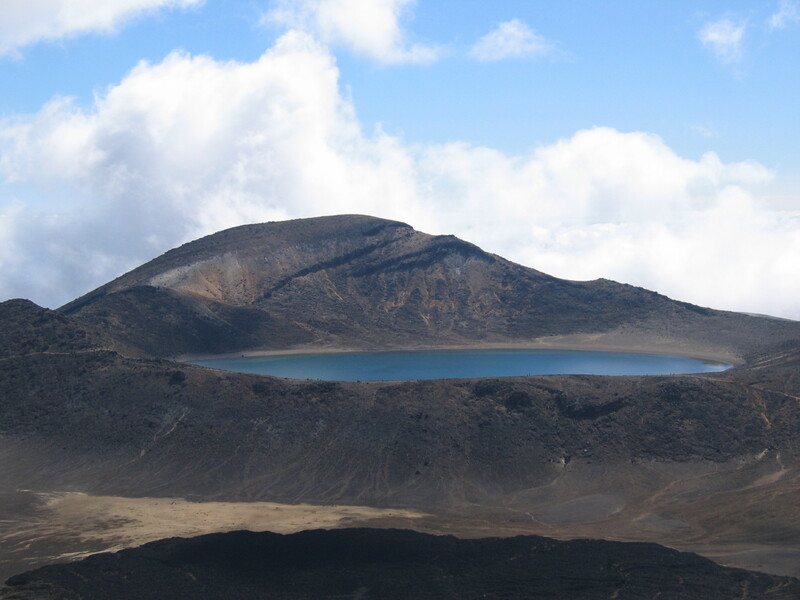 From here there was a perfect view into the Red Crater and on the other side the turquoise and blue volcanic lakes. To get down on the other side another technique was used. This piece of the trek was with only small loose stones and therefore we went down in slalom curves in order not to go too fast and fall and land in one of the Emerald Lakes. After this part is was time for lunch with a beautiful view over the lakes, but unfortunately also with the smell of rotten eggs in the nostrils due to the volcanic activity. 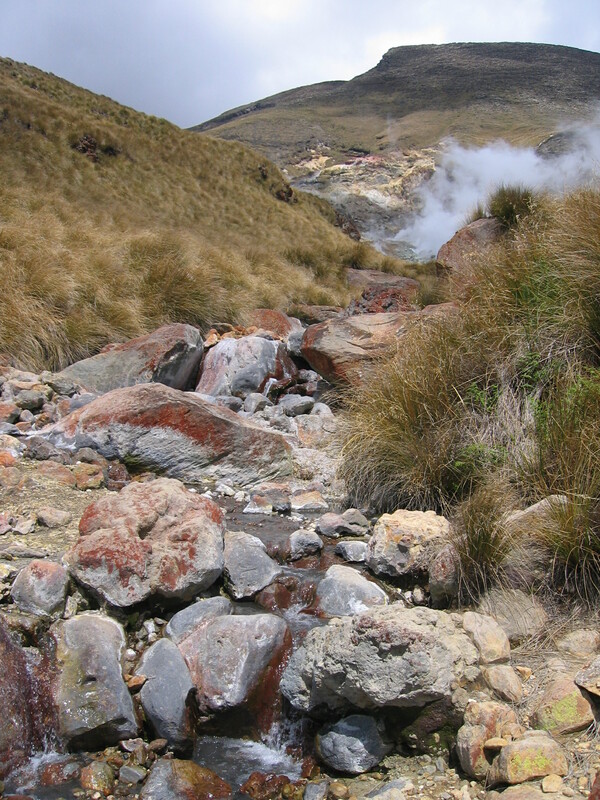 The next part of the trek is through the Central Crater to the Blue Lake. 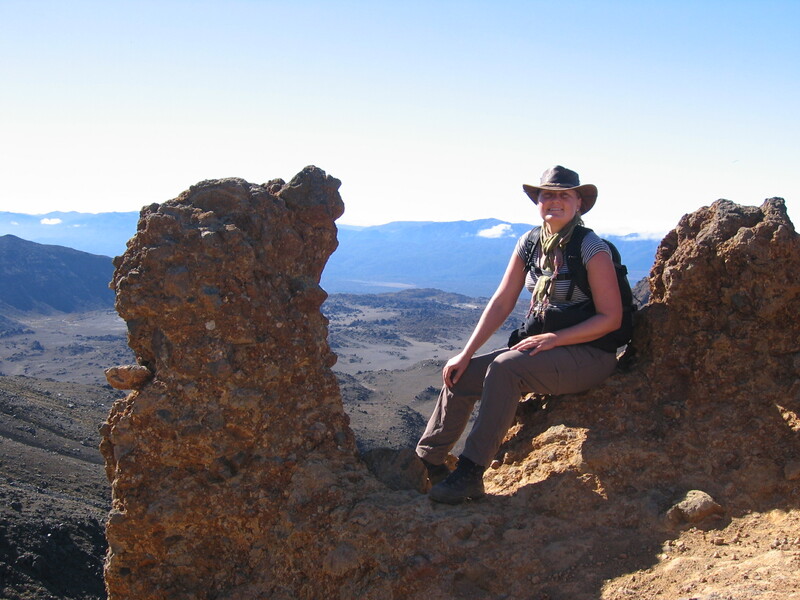 Even though the clouds started rolling in, from here there was a fantastic view over to the Red Crater and down the Central Crater where it was very visible to see the lava flow from the last eruption from Mt. 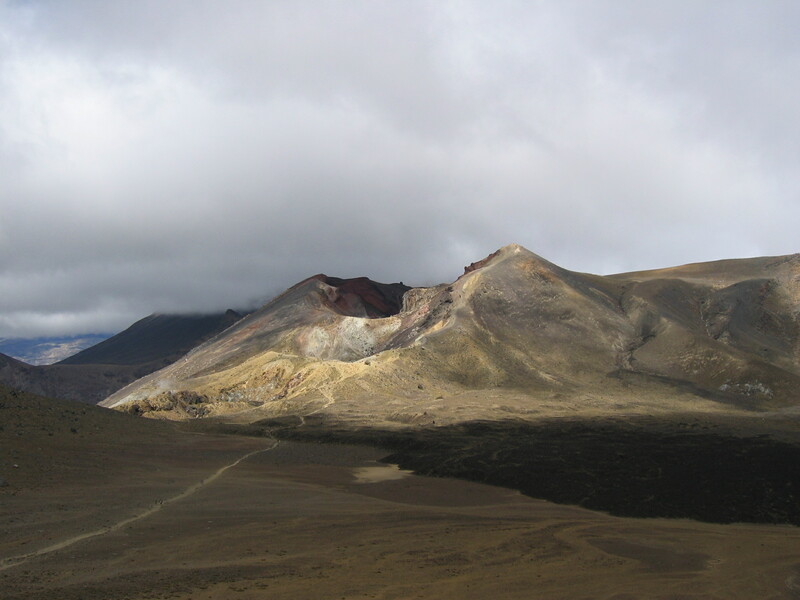 Tongariro. At the other side of the Blue Lake there are views over Lake Rotoaira and in the background Lake Taupo. 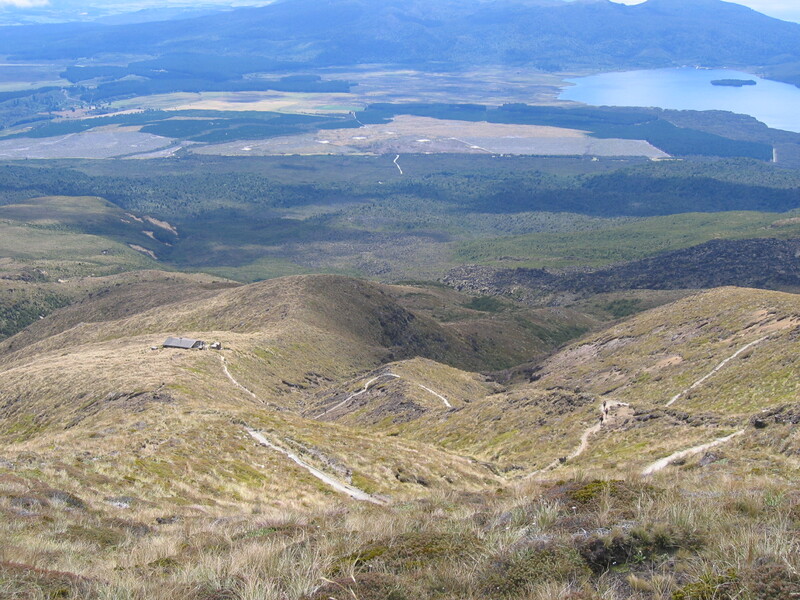 The trek is descending zig-zag to Ketetahi Hut in an alpine landscape. After the hut there is another 2 hours walk to the finishing pick-up point, and indeed just as our bus driver had informed us earlier in the bus to the National Park, it was some very long 2 hours with burning feet in my boots. At 15.45 o’clock after 8 1/2 fantastic hours in Tongariro National Park, we reached the parking lot. After a while waiting for some other hikers to come down, the bus drove us back to Taupo where a shower, take away pizza and massage of the legs was much needed. What to bring for the trek? I guess most people know that the “Lord Of The Rings” movies and also “The Hobbit” have been filmed in New Zealand. I totally understand that this country was chosen as scenery for the adventure of the precious ring and the hobbits. To be honest, I haven’t read Tolkien’s books and before I actually was in New Zealand, I think I had only seen one of the first movies. But because I got so much in love with the wild nature of the country, before I left, I had seen them all. In many of the hostels the LOTR DVD’s were just as much part of the amenities in the TV room as pots and pans in the kitchen. 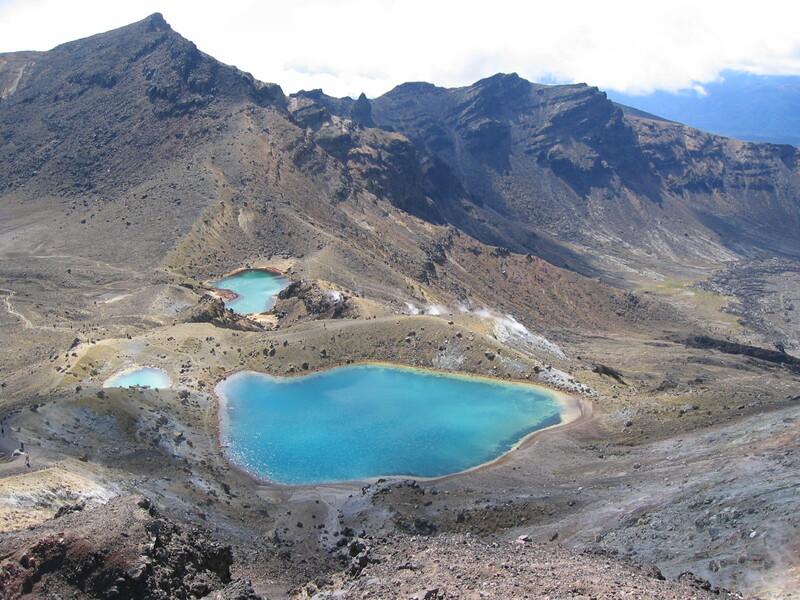 Much of the journey of the hobbits Sam and Frodo is filmed in the Tongariro National Park. 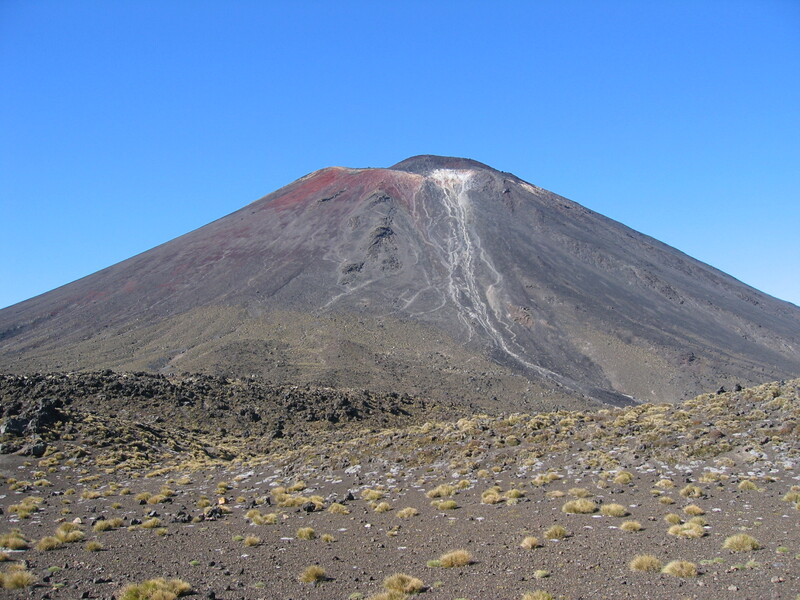 The jagged volcanic landscape is perfect for picturing Mordor and actually a digitialised version of Mount Ngauruhoe is the famous Mount Doom in LOTR. 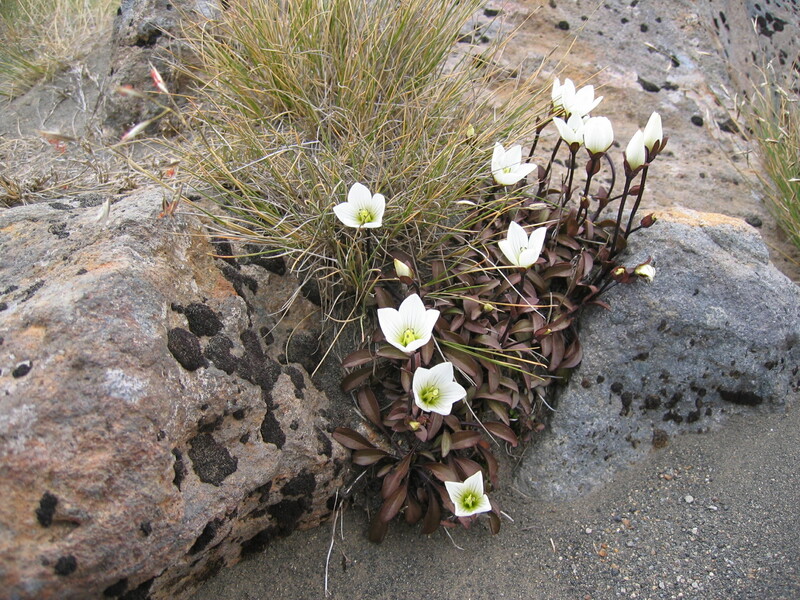 I travelled New Zealand from north to south for 7 weeks in February and March 2007. I hope to write more on Circumnavigator Blog another time, but in the meantime if you have any questions to travelling around this beautiful country, please feel free to ask me. I will gladly help with more information. I have a confession to make. On the one month anniversary of Circumnavigator Blog, I have to admit that I actually have ulterior motives for creating this travel blog. It is not that I don’t love to travel and through this media also share my experiences with the audience that wants to listen. But honestly another very important reason for this blog, is a thing a lot of people is struggling with all over the world these days – unemployment. And the answer is: travelling. That is and has always been my number one hobby and I have spent a lot of money on my travels but during my education where I spent 4 months studying in Finland and in many of my past jobs, I have luckily also managed to combine work and travels. As an example see my post about My longest road trip in Germany. 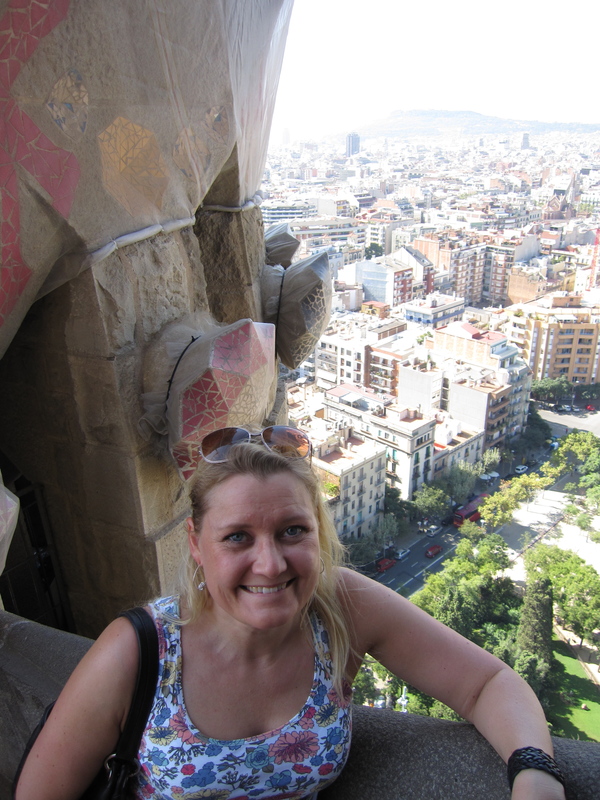 So I thought: “Why not work with travelling and tourism full time?” Unfortunately, I have no experience working in the tourism business – well, apart from many years ago when I was a kitchen assistant in a 4 star hotel in London for almost one year. But I have travelled around the world, I speak and understand a handful of languages and being a former sales and marketing manager who thinks creative, why not combine it all, I thought. So here it is: the Circumnavigator Blog about my travels which is also created to tell the world that I would love to have a job that can connect my hobby with the fact that I need to earn some money to survive and of course consequently travel some more. Further to this, I have made a Facebook page where I share my blog posts and give advice to other travellers. 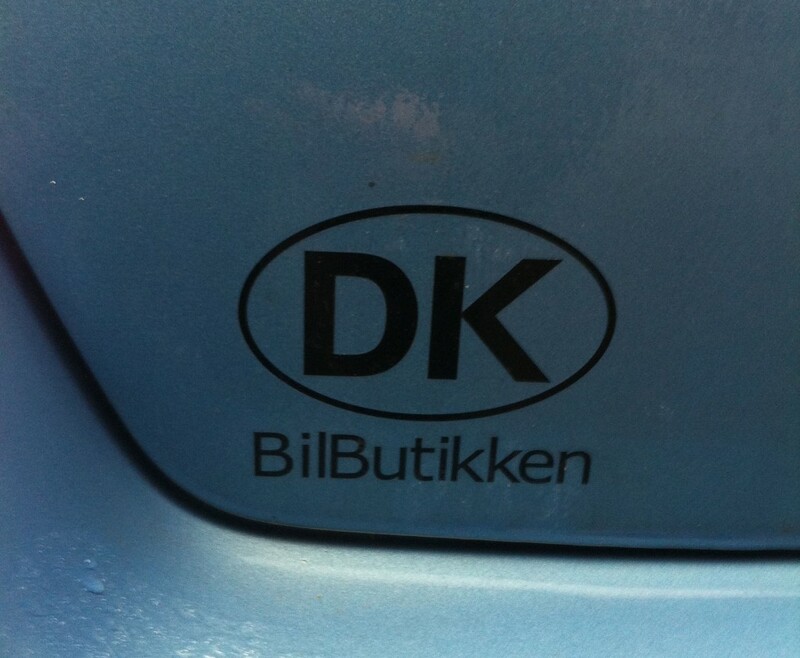 I try to keep most of my material in English but some of the advices are also in my native tongue, Danish. I also use other social media like Twitter, LinkedIn and Pinterest to market my blog. I do hope that this will spread the word and possibly end on the computer screen of a potential employer that like what they see and find me interesting for a job in their company. At this point, I haven’t defined my dream job 100 percent. I also don’t know where in the world it will be situated. But please do not hesitate to contact me, if you can help me closer to a job within the tourism business, or where I can combine work with travelling. 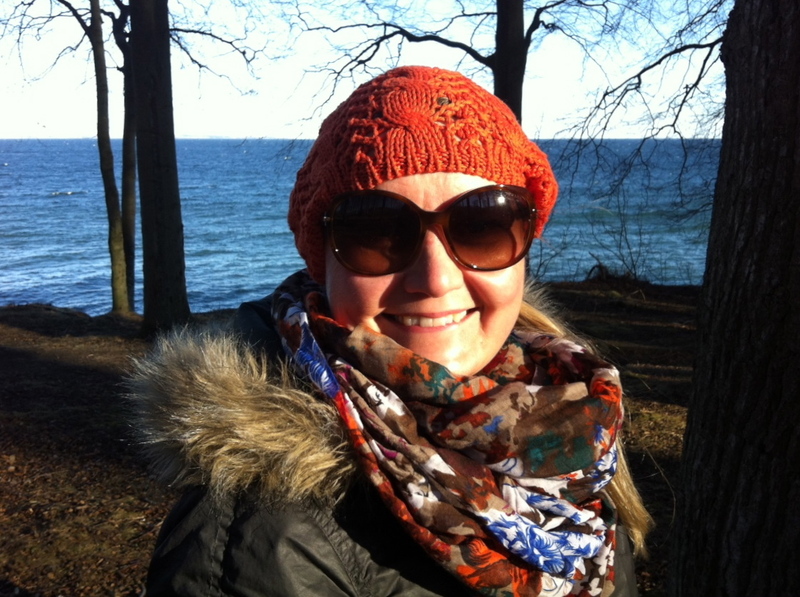 To learn more about my professional work life please visit my LinkedIn profile – Kirsten Hjorth Rasmussen. The other day I met an acquaintance in my local fashion department store. 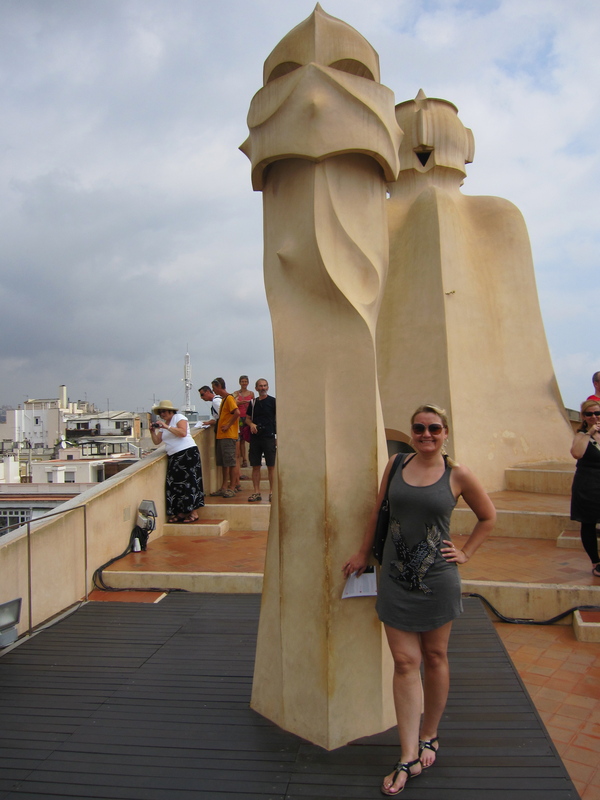 I know her through a friend, but we share the same passion for one of Europe’s most fantastic cities: Barcelona, so we had a good talk about the charm of the city. 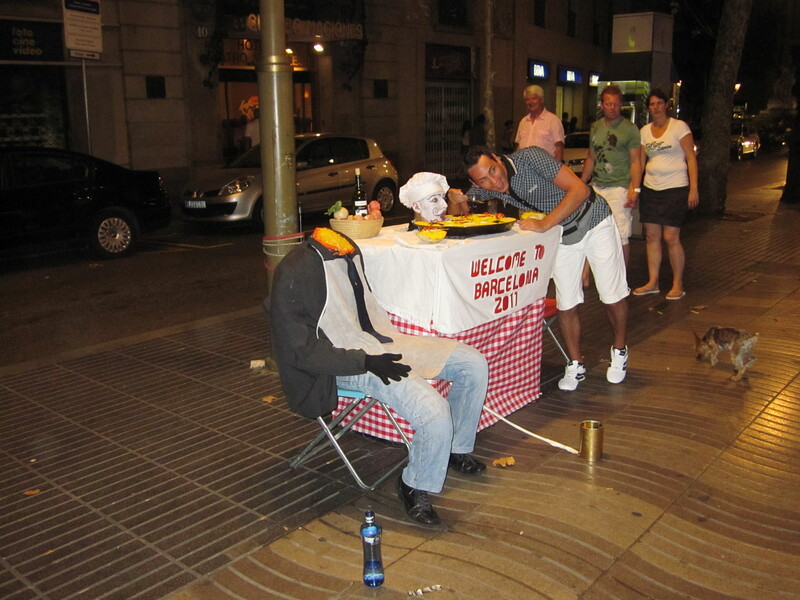 I have only visited Barcelona once. 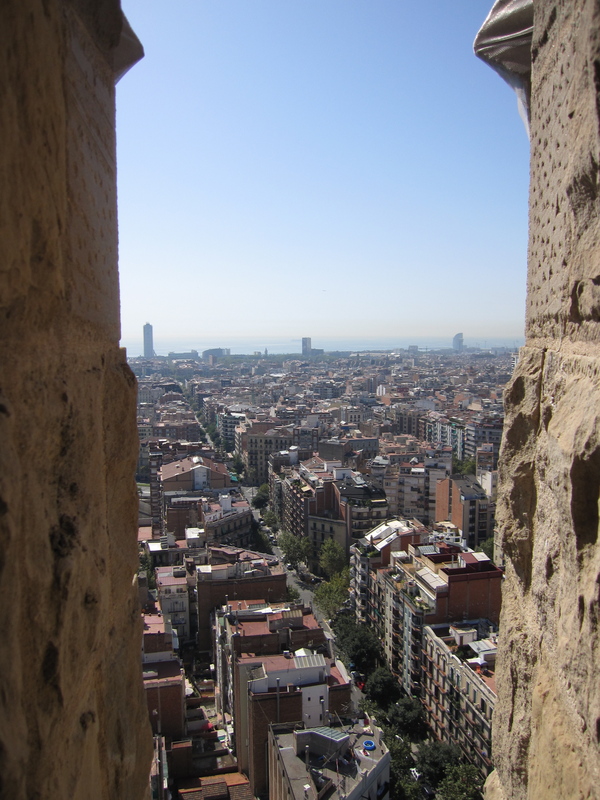 Last summer I was there for little less than a week, but I must admit that it was love at first sight, and I actually, like her, have considered not only once but several times after to move to Barcelona to live there for a period. Maybe I will one day, because this city certainly has so much to offer. 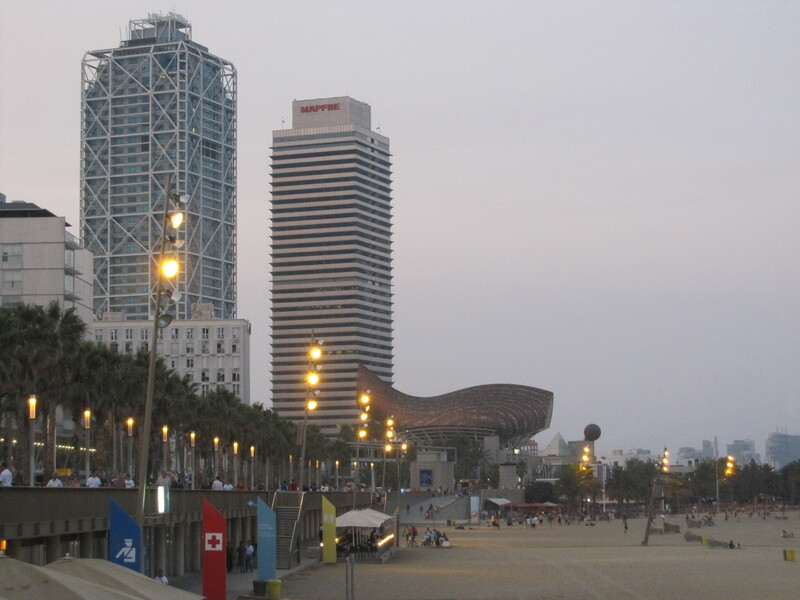 My objective for the holiday in Barcelona was a combination of big city life and relaxing at the beach. 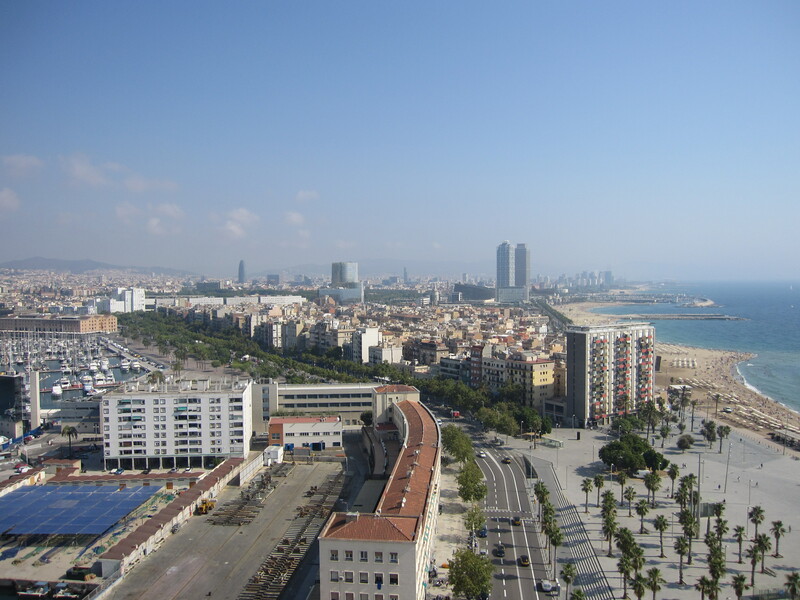 Therefore I chose to stay in the very authentic neighborhood La Barceloneta which is a residential area with narrow streets situated between the Mediterranean Sea and the center of Barcelona. 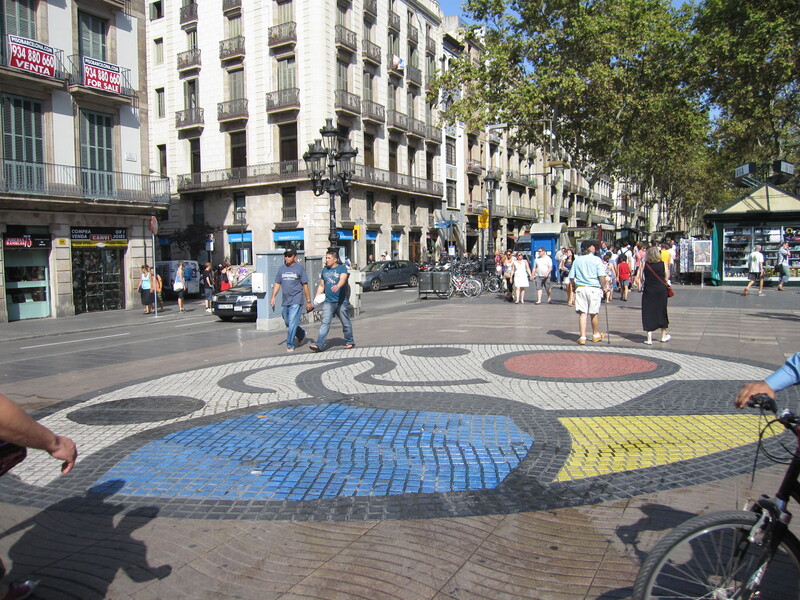 The famous shopping street La Rambla is only a 10 minutes walk away, and the public beach with white sand nearby. 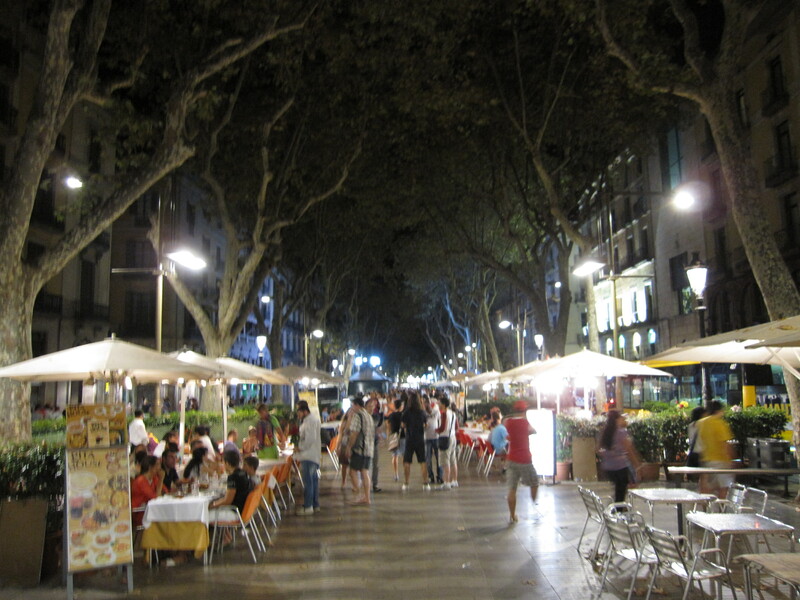 There are several restaurants and bars to chose from in the area. I had perfect tapas at a small bar, Jai-ca Tapes. 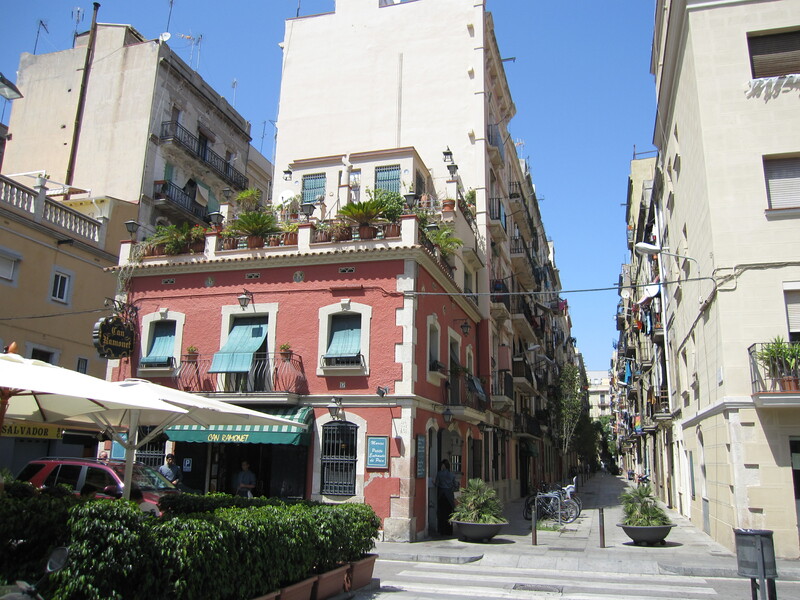 It is full of spanish siesta atmosphere and serve fabulous tapas for locals and tourists. 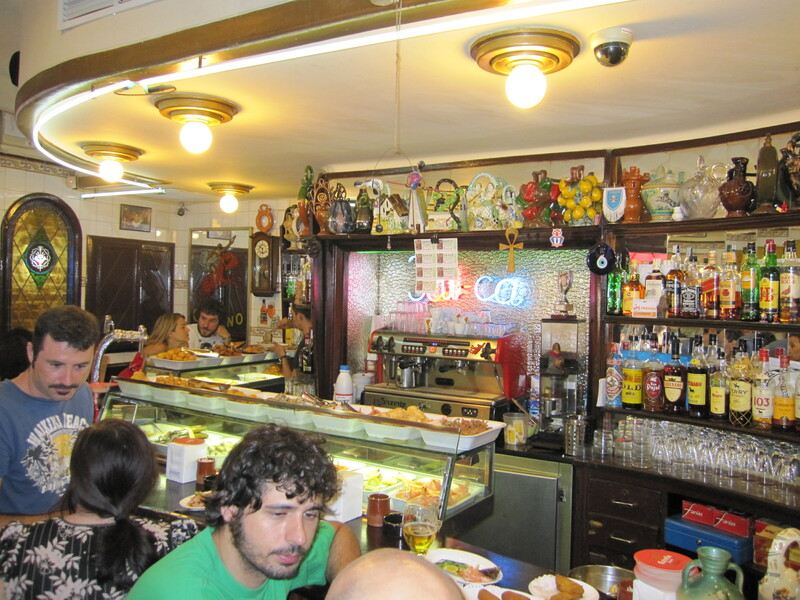 I also enjoyed fantastic seafood at the restaurant, El Rey de la Gamba 1 – be aware: they serve big portions. 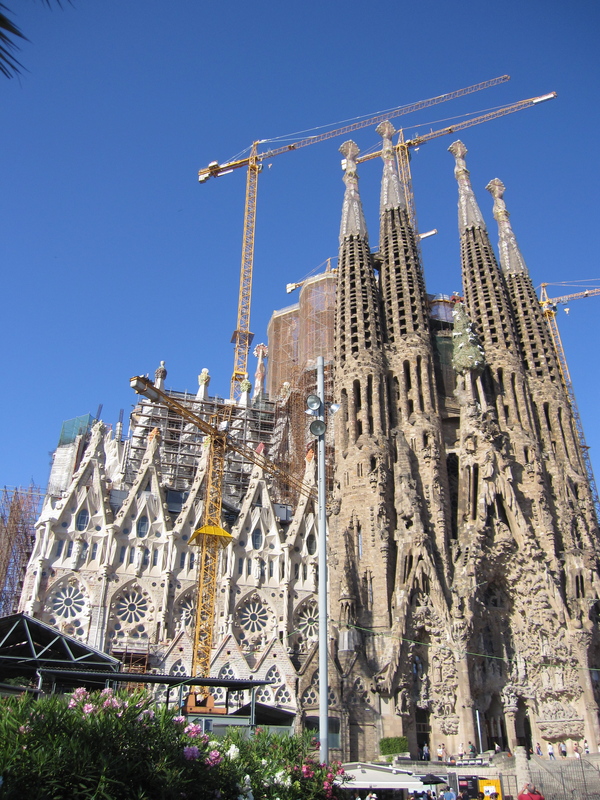 One of Barcelona’s top sights, if not the number one top sight, is the amazing church Basilica de la Sagrada Familia. 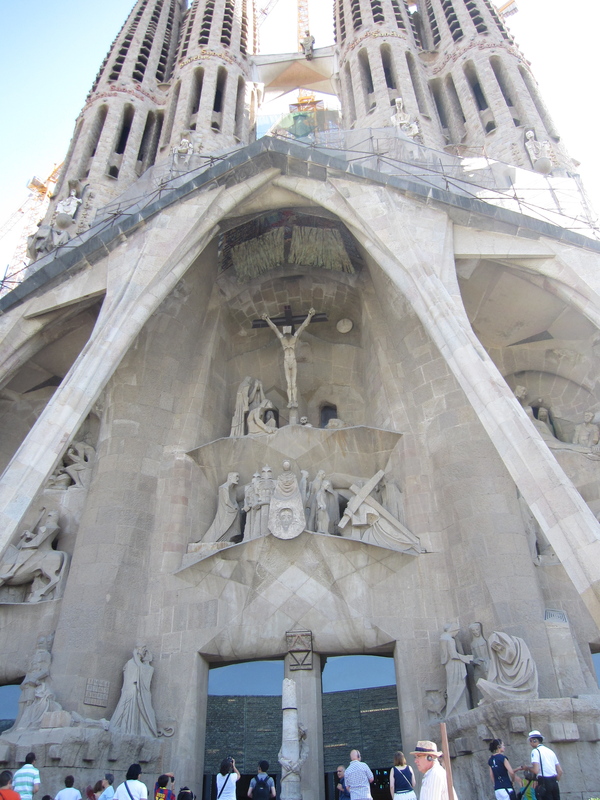 It is designed by the famous modernistic architect Antoni Gaudi and even though construction started back 1882, it still hasn’t finished, but it is a truely also an amazing construction and so full of wonderful details both outside and inside. 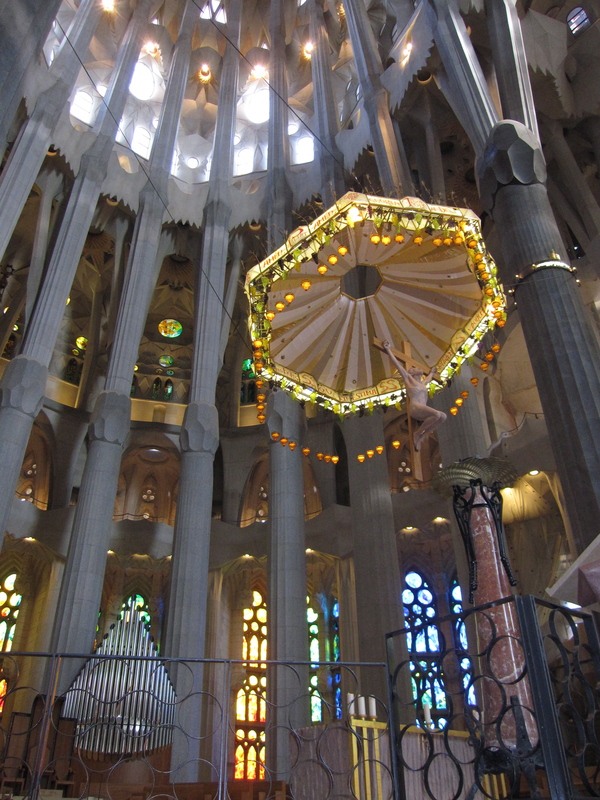 Do reserve many hours for the visit and get up early to be first in line to get in, because the queue of visitors lining up to get in will be very long especially during the holiday season. 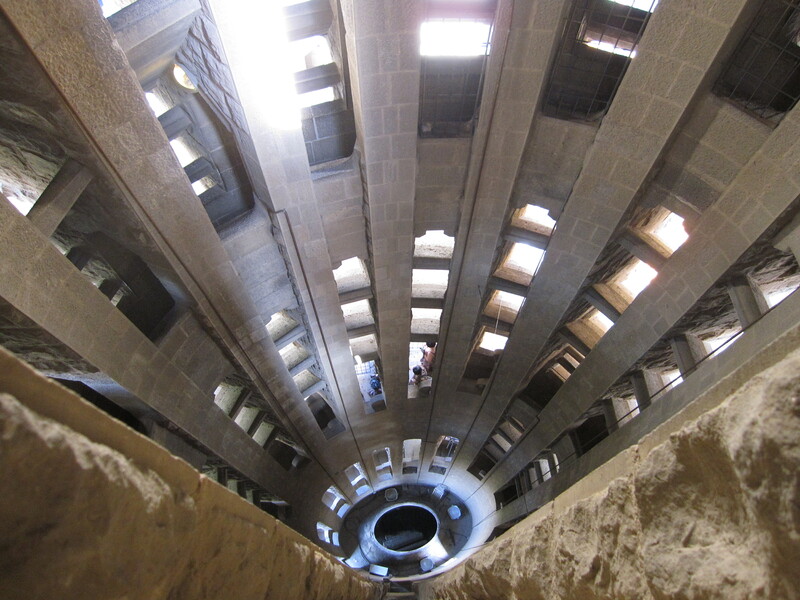 If not afraid of heights, then visit one of the towers. 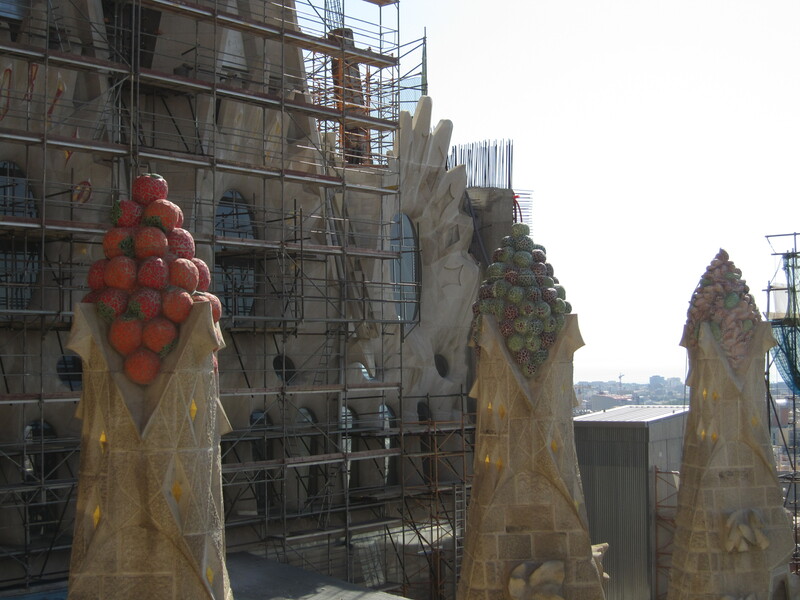 There is a fantastic view over the city and possibility to get a close up look on some of the outside decorations. 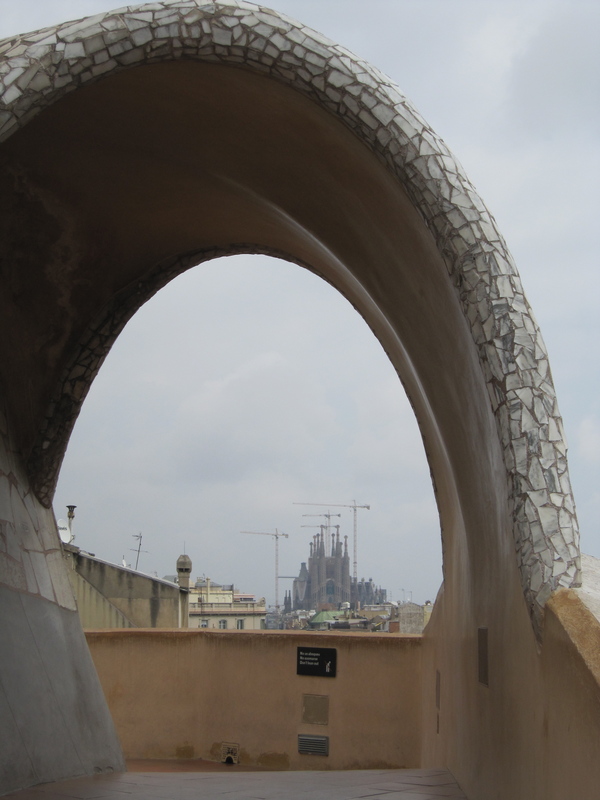 It is not without reason that Barcelona is called the city of Gaudi. 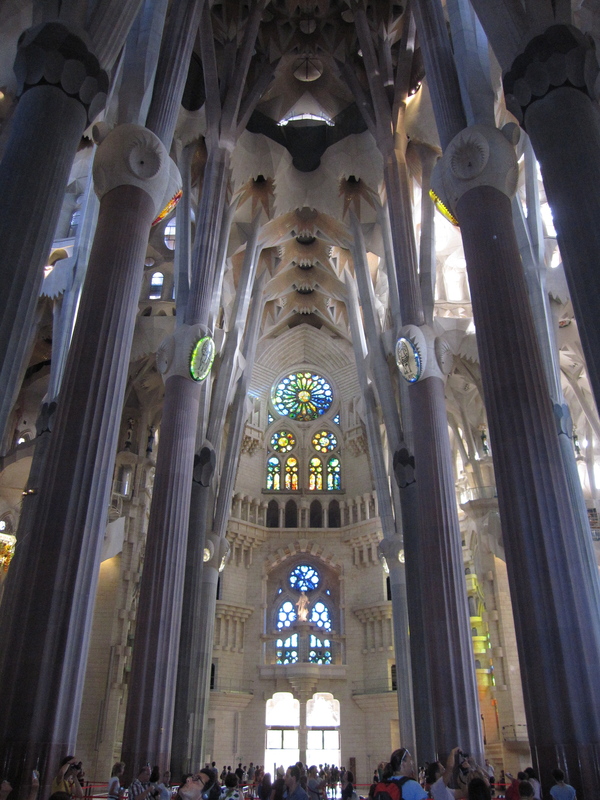 His work has greatly influenced the architecture of Barcelona and you will find it all over the city. 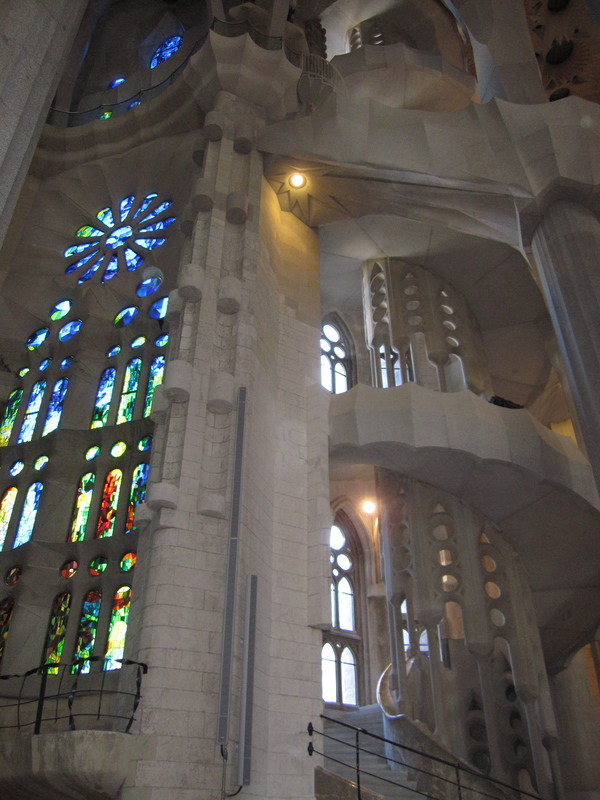 Gaudi’s design was very much inspired by the nature and elements from there and this shows in much of his design with few straight lines. 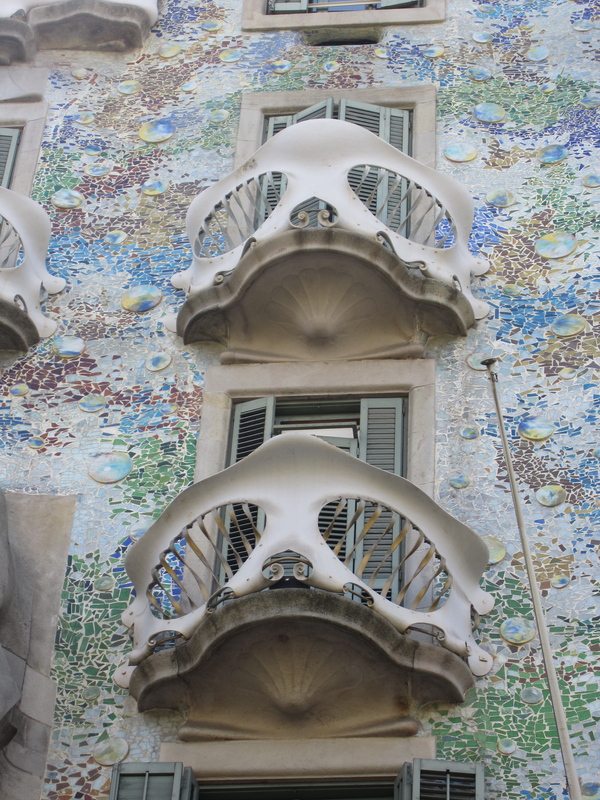 I took a look at the Casa Batlló from the outside while sitting on a bench on the opposite boardwalk and simply enjoying Barcelona. 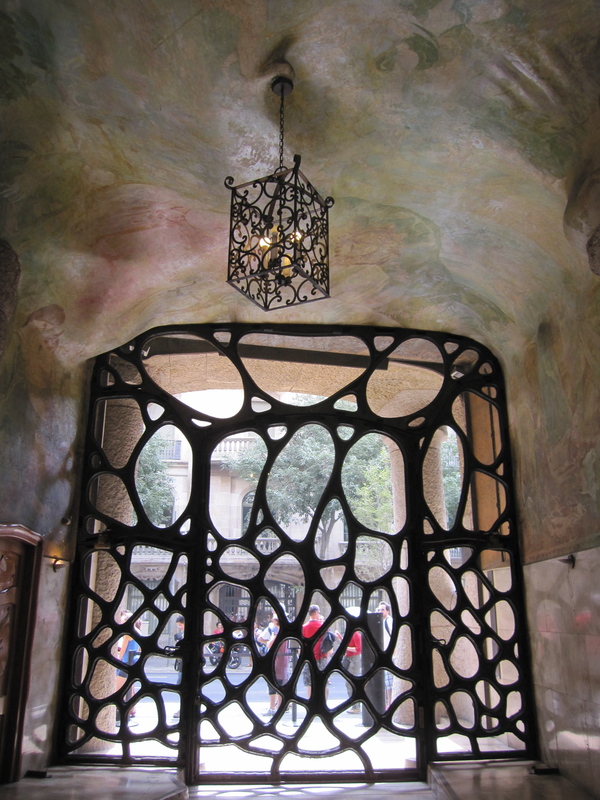 Casa Milà, or maybe better known as La Pedrera, is build around two open courtyards. 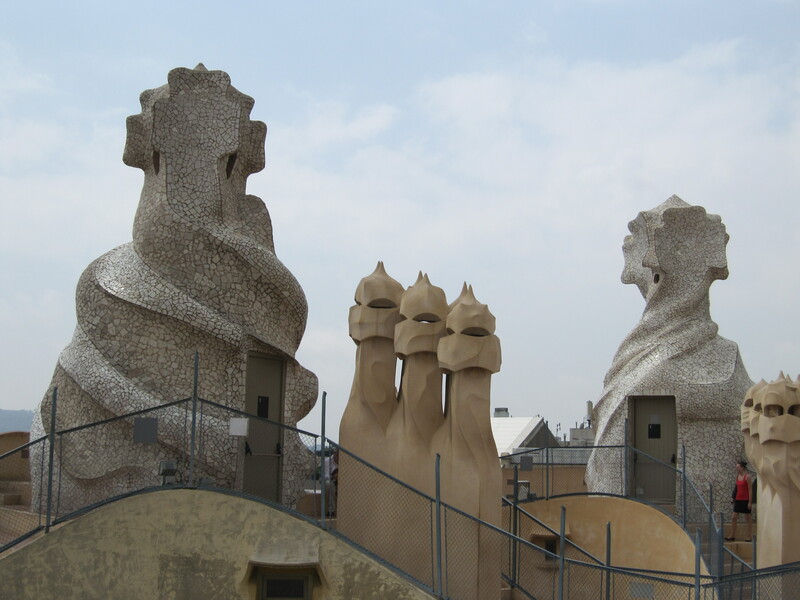 The rooftop terrace is incredible with all the sculptural elements. 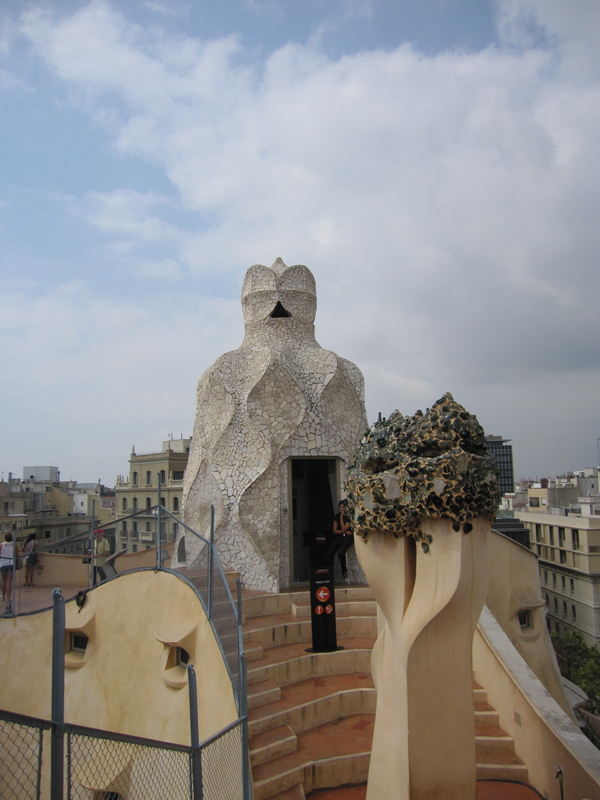 Just below is the attic with an exhibition on Gaudi’s work. 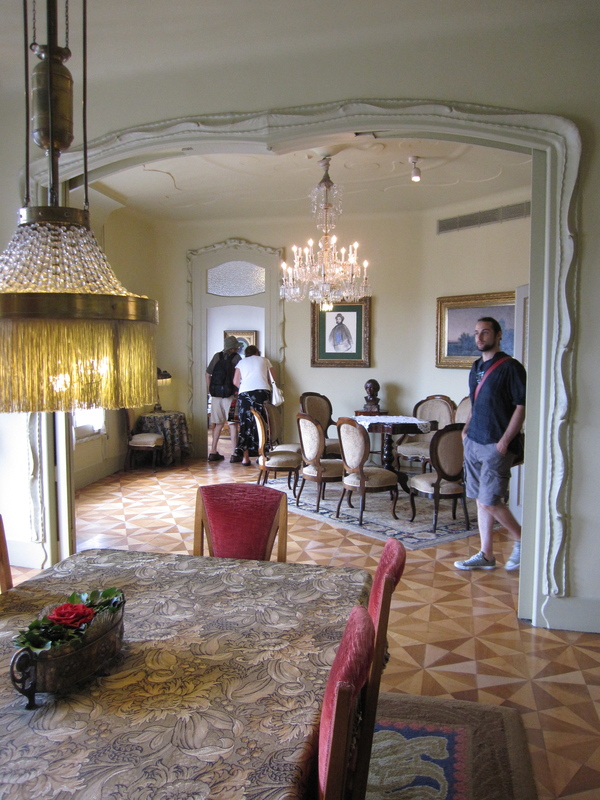 In the building it is also possible walk inside an original furnished apartment. 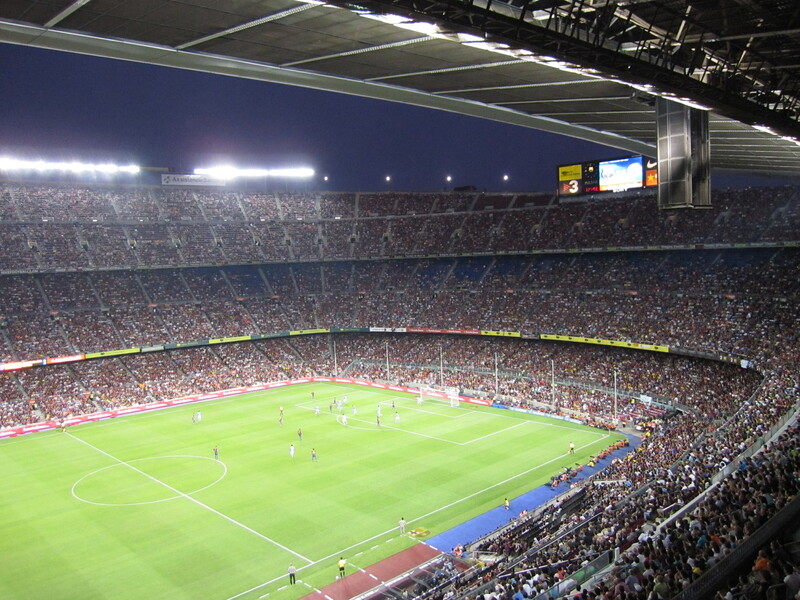 I know not all people are fans of football or sport, but in my humble opinion, I think it is a disgrace if you do not visit one of the worlds best football clubs when you are in Barcelona. 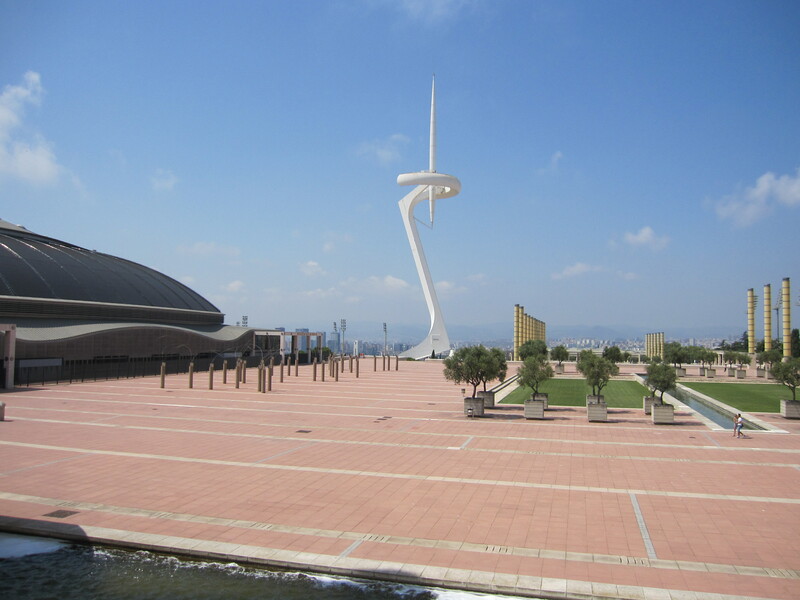 It is a great opportunity to experience a part of the soul of the city – please also see my post about sport and culture. 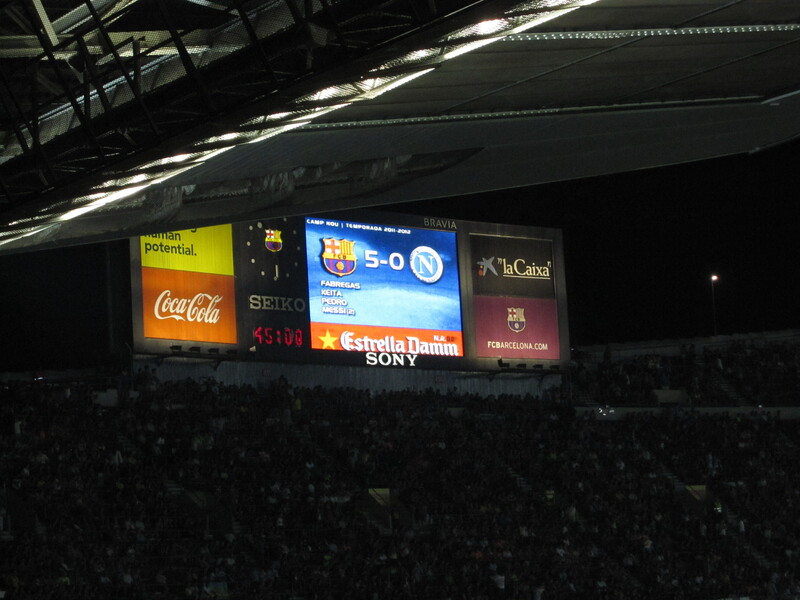 While I was visiting, FC Barcelona was playing a pre-season match against italian Napoli for the Joan Gamber Trophy. 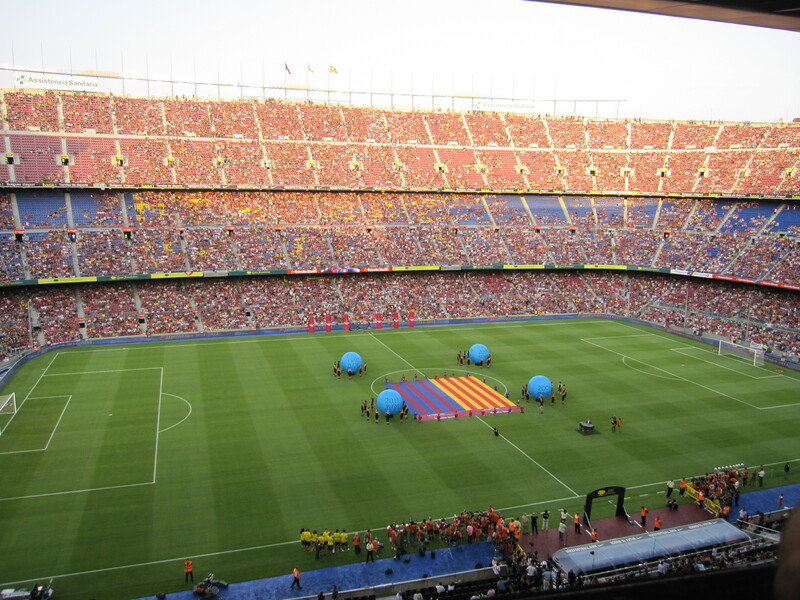 The atmosphere was absolutely amazing on the famous Camp Nou stadium even before the actual match started. The warm-up show alone was worth going, but it also helped a lot that FC Barcelona won 5-0 and Messi scored two of the goals. A good tip when going to the match and leaving the stadium is to incorporate plenty of time for transport, and even prepare yourself to walk most of the way home, since the public transport is absolutely packed with people. 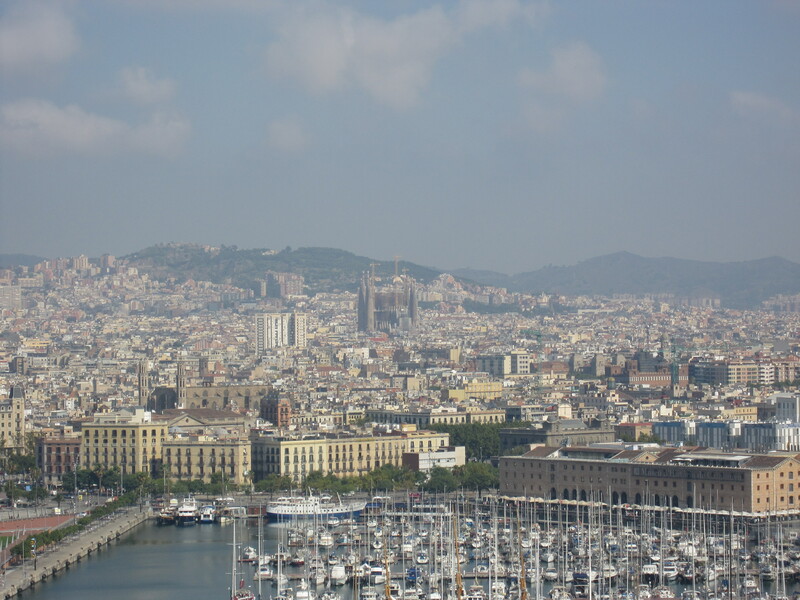 The perfect way to reach the hill Montjuic is by cable car. 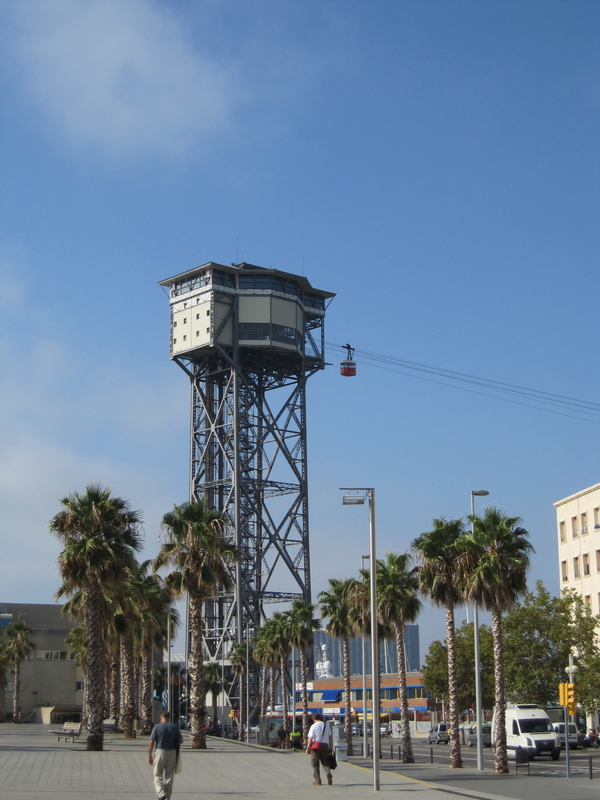 It runs from a tower on the harbour of Barcelona, not far away from La Barceloneta to the hill and gives you a perfect possibility to get a birds eye view on Barcelona. 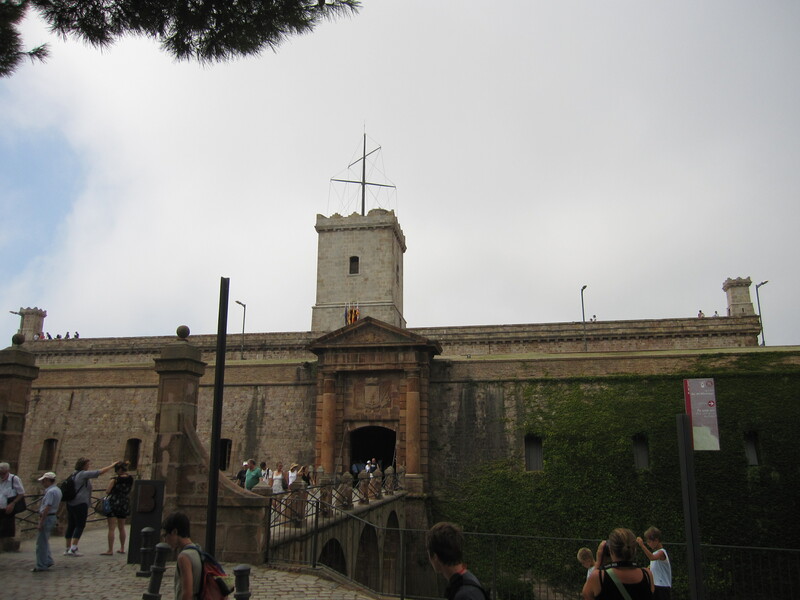 There are several interesting things to see and visit on Montjuic. 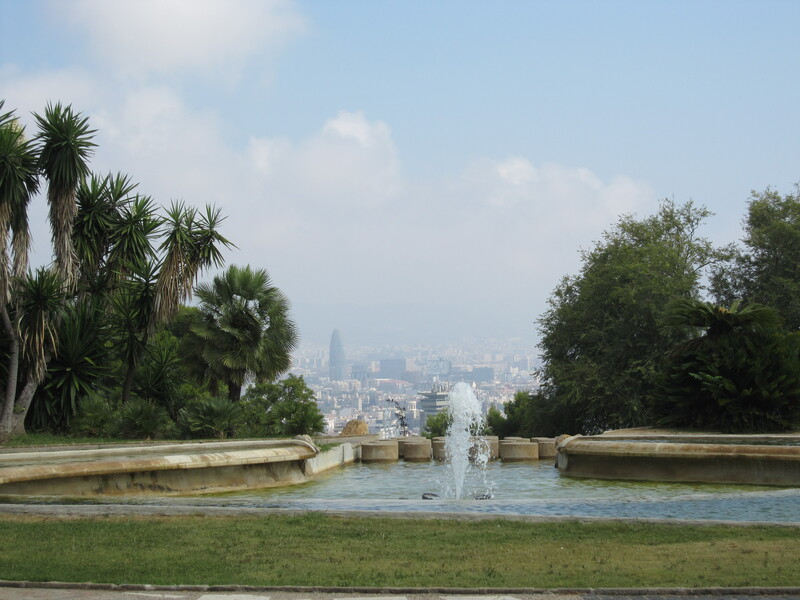 I walked around in the Botanical Gardens, took a look at the fortress from outside, passed a huge cemetery before I headed down to the Olympic Stadium and finally passed the Palau Nacional that was built for the 1929 International Expositions and now is an arts museum. It is a long walk so wear good walking shoes and bring plenty of water. I was there on a very hot summer day at almost 35 C and at one point I unfortunately ran out of water, so was very happy when I finally reached the café at the stadium. 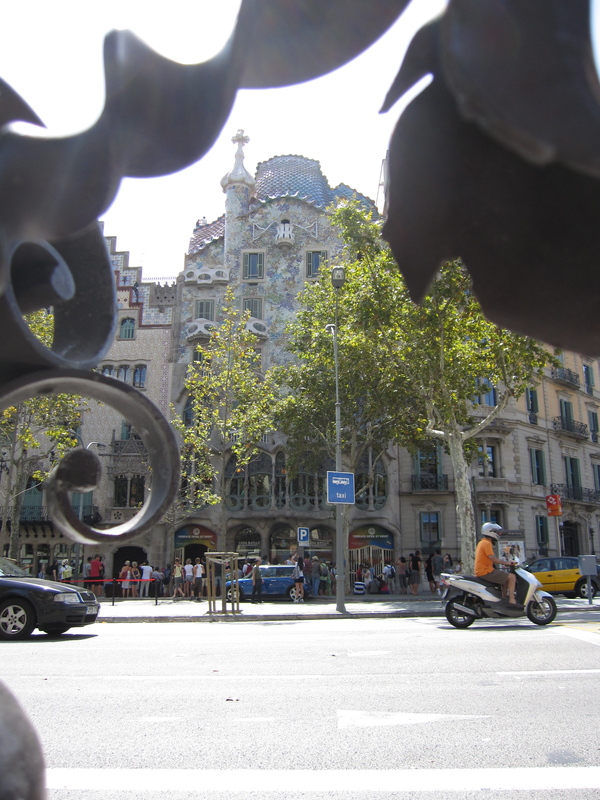 When in Barcelona do also reserve time for shopping. 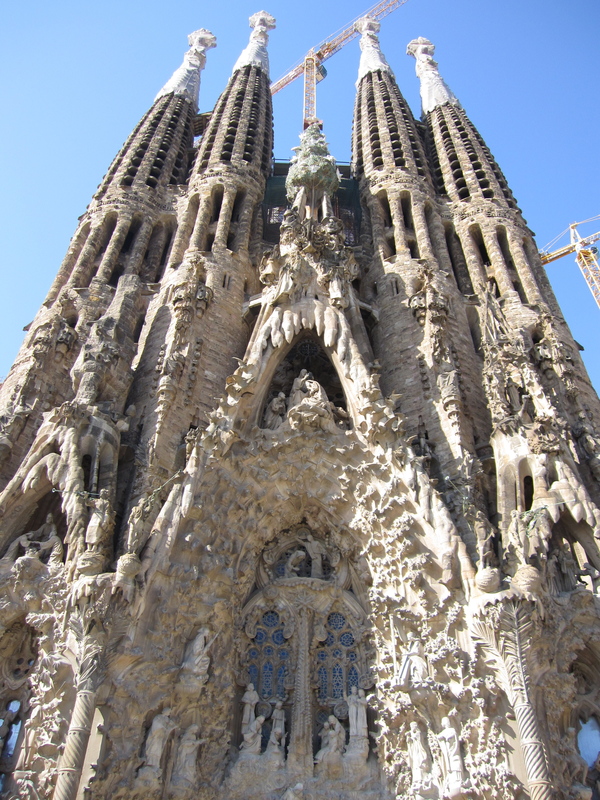 It can easily be combined with sight seeing since many of the popular sights are actually situated on the shopping streets. 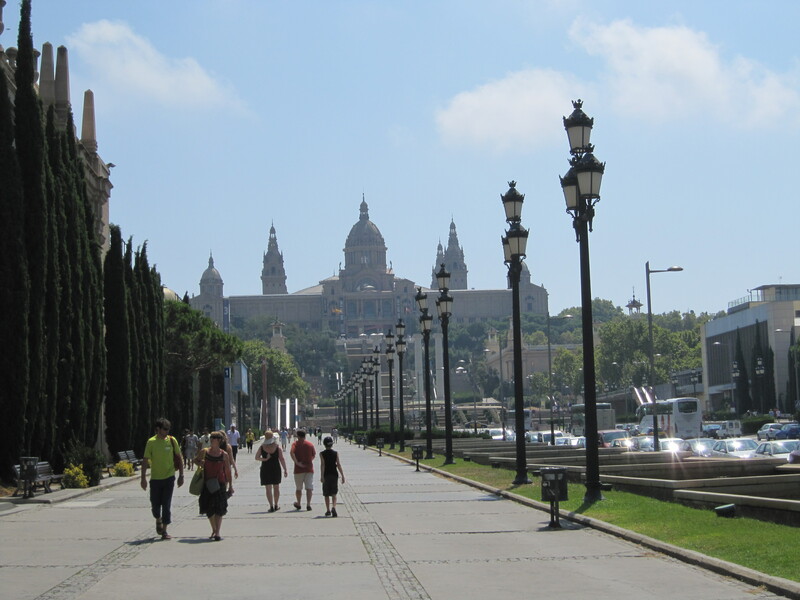 Not to be missed is of course La Rambla that stretches over 1,2 km and connects Placa Catalunya with the Mirador de Colón close to the harbour. It is full of life from the early morning to very late evening and there is always something funny and interesting to look at. 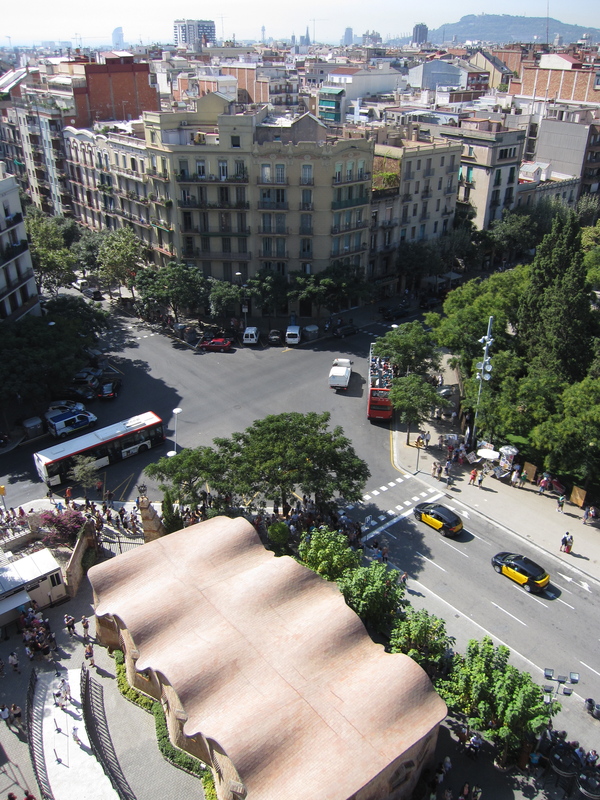 Another street where to find a variety of high street fashion shops in is Passaig de Gracia. 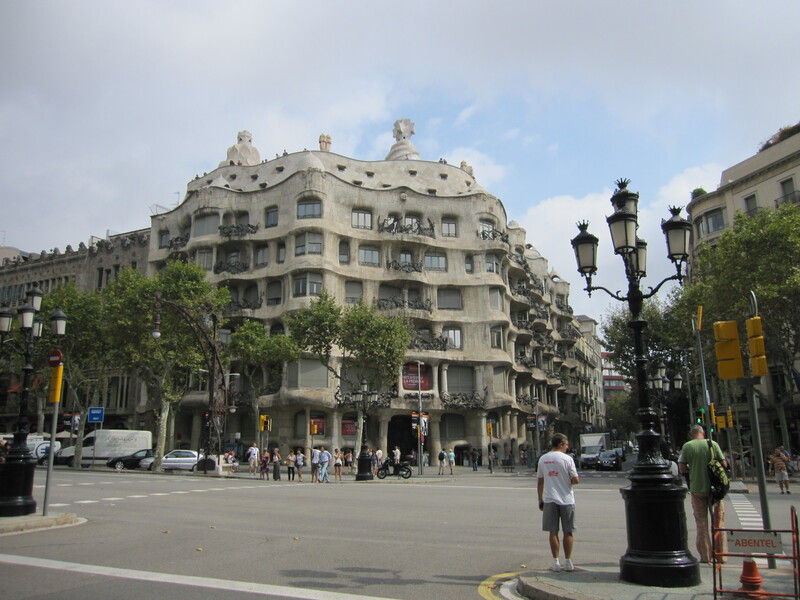 This is also where Casa Batlló and La Pedrera are situated. 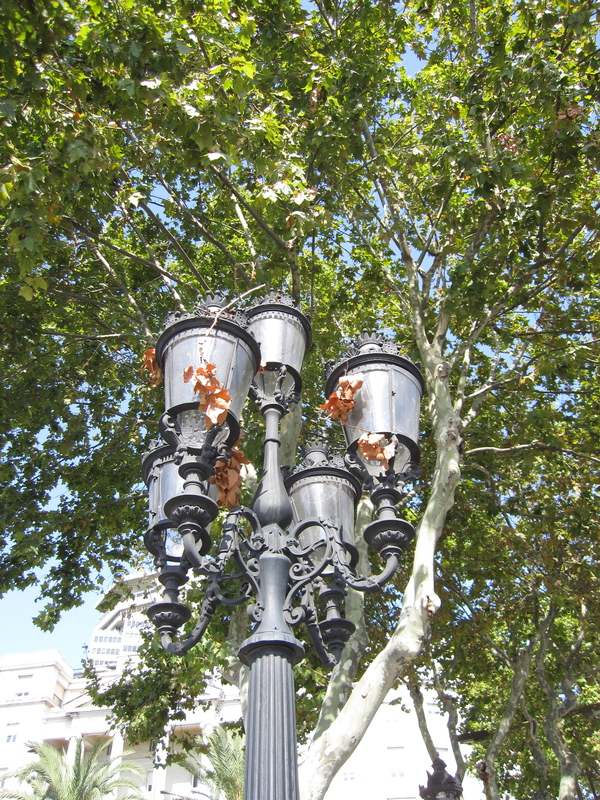 On Placa Catalunya you will find the department store: El Corte Ingles. Popular and affordable spanish fashion brands for ladies are: Mango, Zara and Desigual. And do not forget to look out for shoes and bags. Leather goods are of good quality and less expensive than in many other countries of Europe. 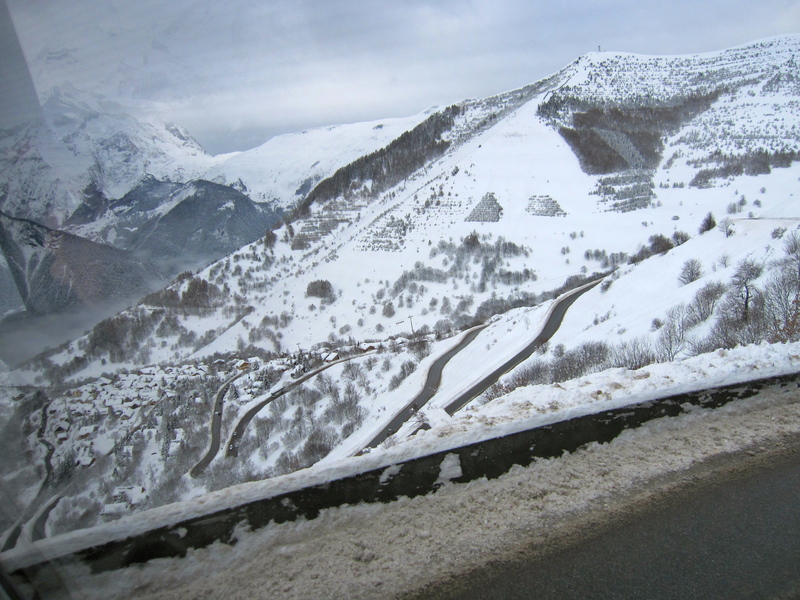 Driving on the road up to Alpe d’Huez you pass through 21 hairpin bends. In each of the bends there is a plate with the name of one of the Tour de France winners on the legendary mountain. But Alpe d’Huez is not only for Tour de France bikers. 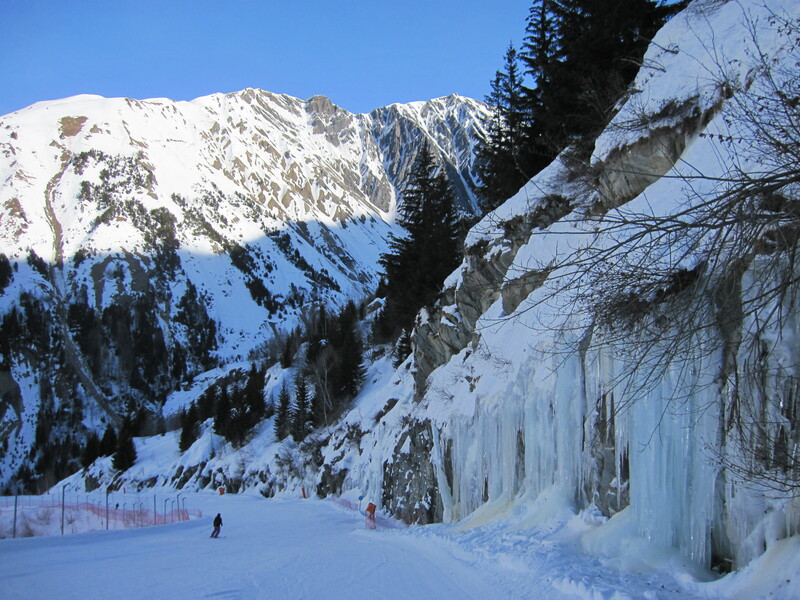 During winter it is a very good ski resort, both for beginners and advanced skiers. 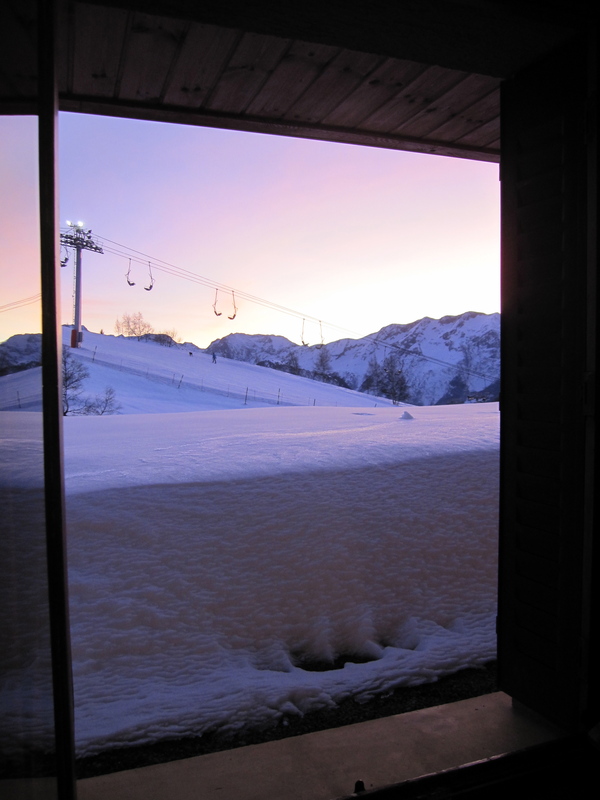 In January 2012 my brother and niece invited me to join them on their annual skiing holiday. They are both very good and fast skiers, whereas I myself is more relaxed about the skiing. I can, if I really want to, go downhill on a black piste, but I definitely prefer a blue or red piste. Even though the need for speed is in my blood, can’t deny that, I guess I’m more for the relaxed downhill skiing where I also take the time to enjoy the scenery around me. Just the sight of the magnificent mountains around me, is something very special – I grew up in a country where the highest point is only 170 meters above sea level. 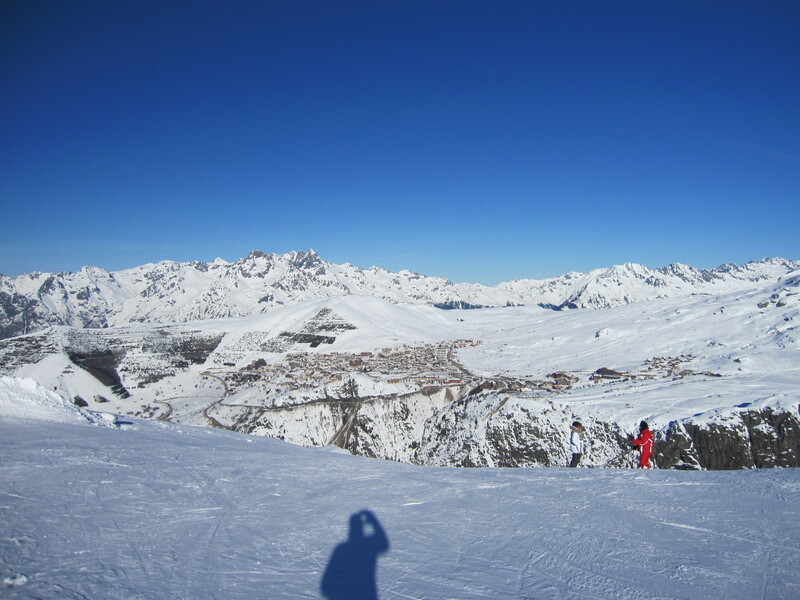 The Alpe d’Huez with surrounding towns has a total of 250 km pistes so there are plenty of different pistes to explore. I think it great to get up fairly early in the morning and go the furthest out you can in the area and then use the following hours working your way back – going down one slope and up in a lift, down another slope and up in another lift etc. In Alpe d’Huez, I recommend to take the trip out to Montfrais and then return to the foot of Signal going through the villages of Vaujany and Oz en Oisans. Fantastic skiing and scenery. 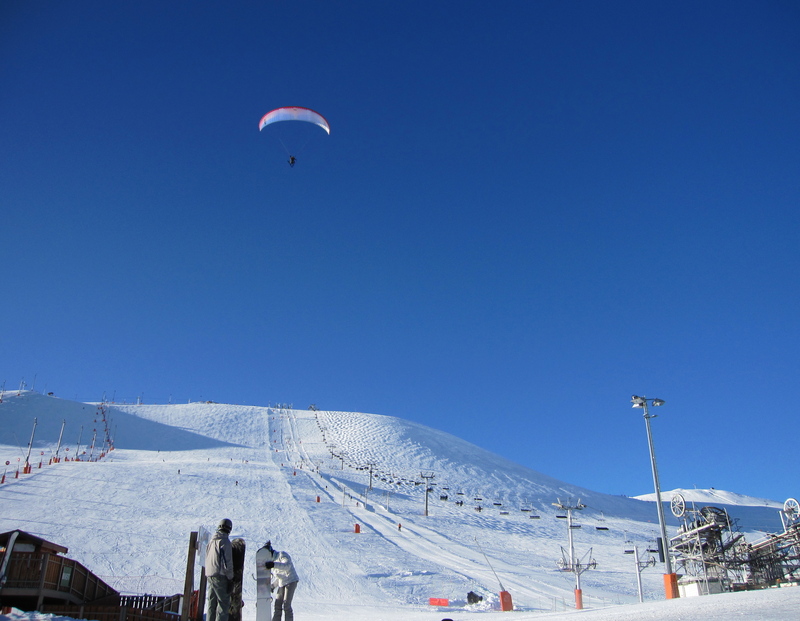 Another must do in Alpe d’Huez is the La Sarenne run, but I advise only to do it if you are an experienced skier. The first part is really steep. A very easy but beautiful piste, and perfect for the final day run, is the one going down to the village Huez from Alpe d’Huez. 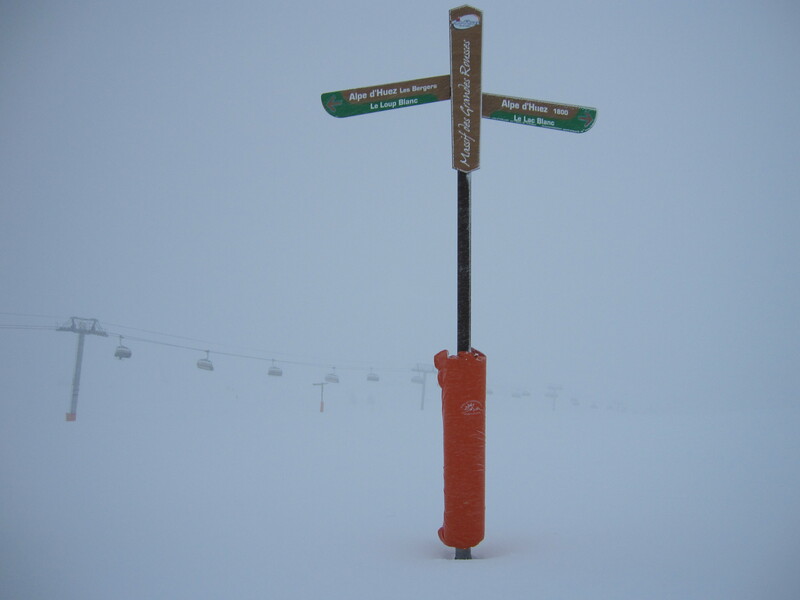 Please click Alpe d’Huez for all information about the resort and a detailed map of the pistes. 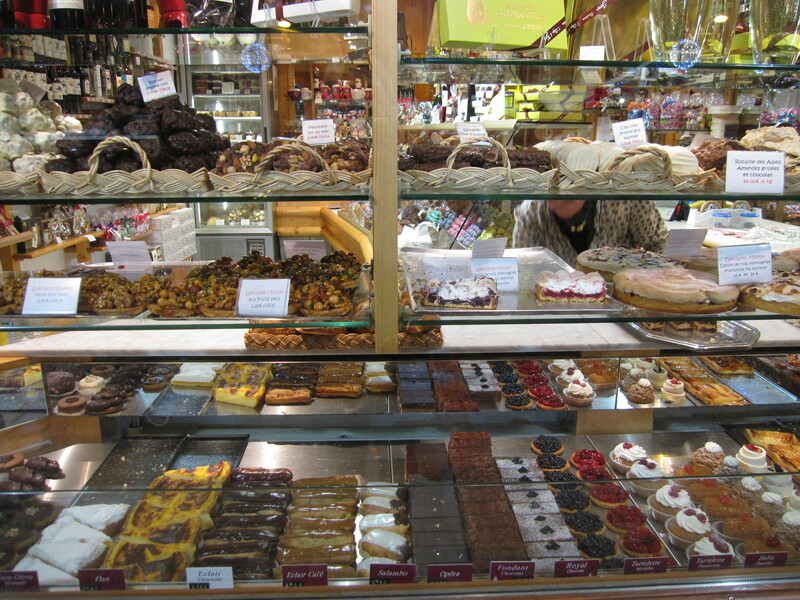 Another great thing about holidaying in France is of course the food. 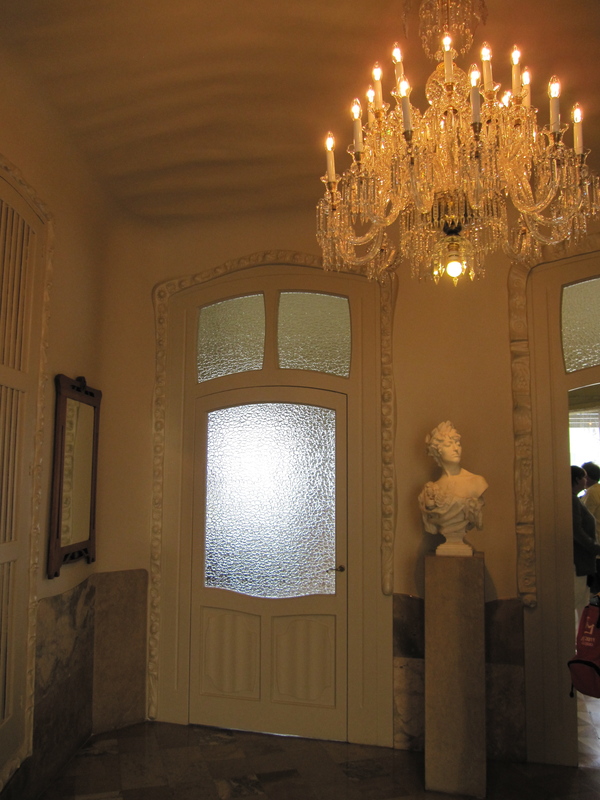 We stayed in a hotel with breakfast and dinner included and even though the kitchen was run by Danes, the food was inspired from the french kitchen, so absolutely lovely. 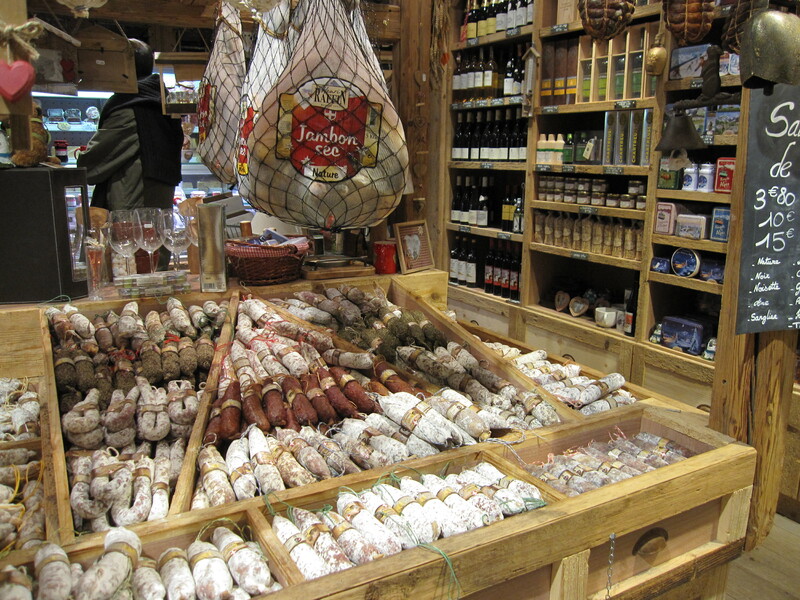 If you want to source your own french specialities, I can recommend to visit some of the delicacy shops in Alpe d’Huez. Both the sausages and the sweets are absolutely delicious. For lunch on the mountain, I recommend a pizza at the little cosy Chalet du Lac Besson reached by the piste Boulevard de Lac. The food there is excellent and on top the view from the terrasse is fantastic. 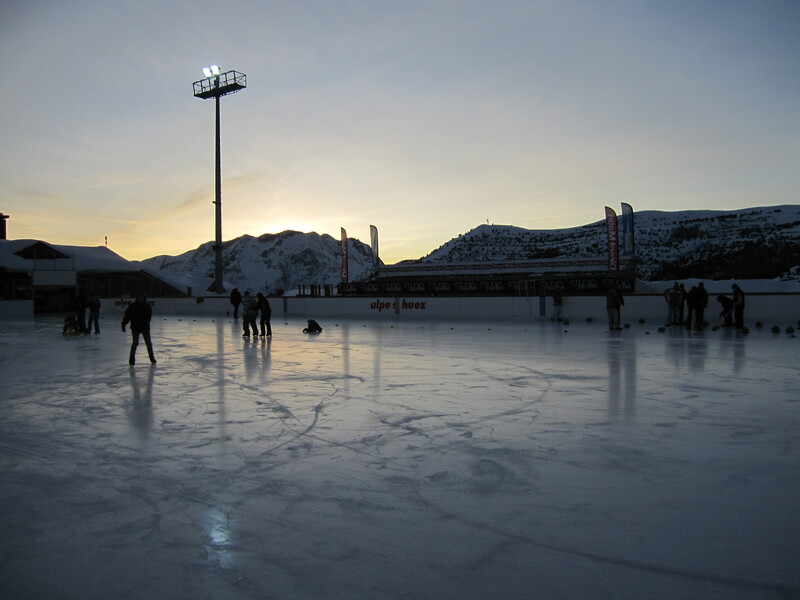 In Alpe d’Huez there is also an outdoor swimming pool and a skating ring. Unfortunately I didn’t find the time for any of these activities, but it looked great. I did try out the after skiing but being a little bit “germanophile”, I must admit that I prefer the after skiing in the german speaking Austria. In Alpe d’Huez there are several bars to choose from and also good party vibes late in the evening, but the Austrian after skiing starts much earlier in the afternoon and is full power compared to the French. All together I consider Alpe d’Huez a complete skiing resort. I had a great week there with my family and did some amazing skiing. 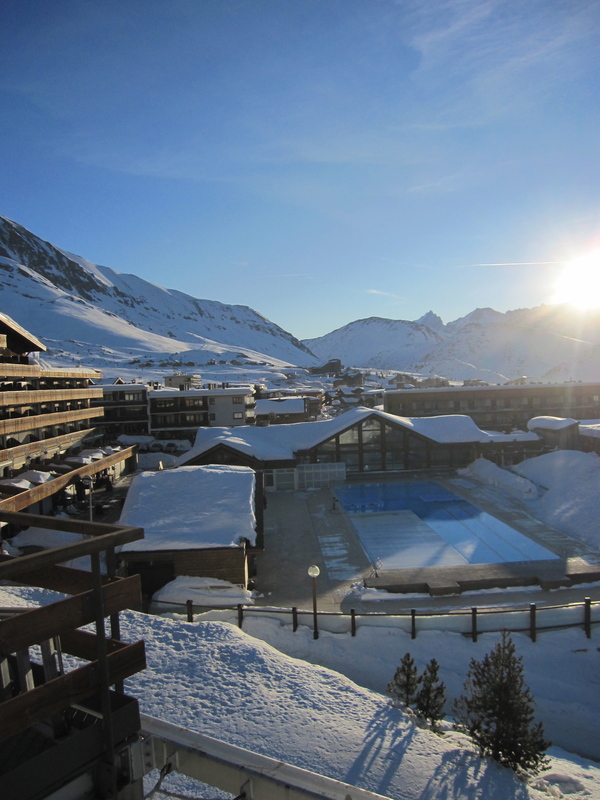 It is said that there are 300 days with sunshine in Alpe d’Huez. The first days we had bright sunshine from a blue ski – the last couple of days very heavy snow fall, but it also has it’s charm to experience snow fall of minimum 50 cm within 24 hours. Though not really the best skiing weather. My last day in Alpe d’Huez, I went up and down one time only – doing otherwise for me wouldn’t be safe. Did you try out some great ski resorts? And why were they just perfect for you? Please let me know for inspiration to my next skiing holiday.